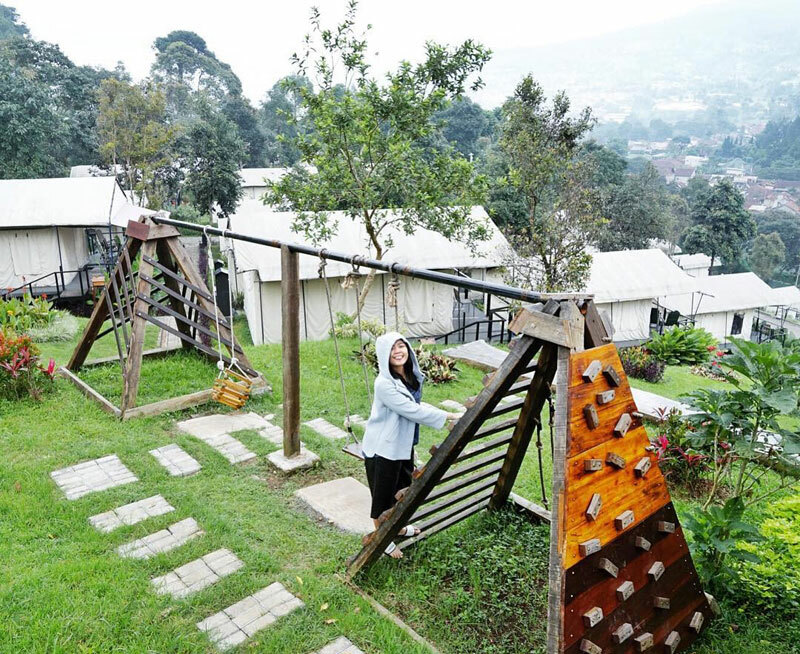 20 Fun family-friendly hotels in Bandung with exciting activities in cooler climates! 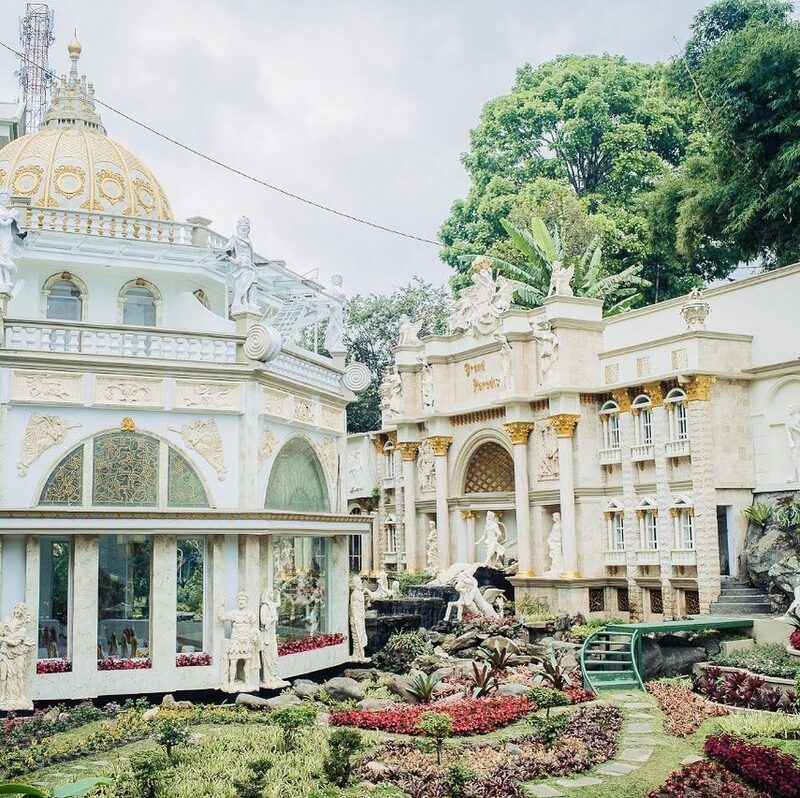 If you’re looking for a fun-tastic family break to cooler climates, consider a trip to the Paris of Java – Bandung! The destination offers plenty of family-friendly hotels that provide wild spaces for the kids, along with comfortable family rooms and much more! 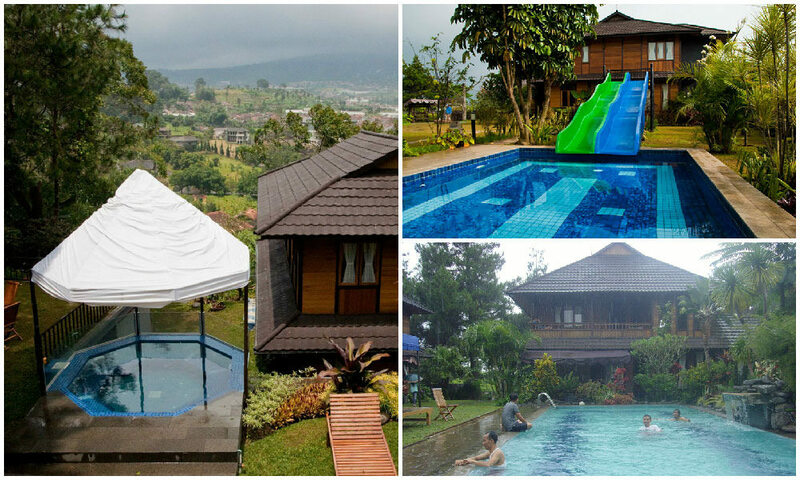 Whether your children have been begging for the full gamut of activities while on holiday, or are happy with a simple help-yourself strawberry-picking and a swimming pool (with thrilling slides), our comprehensive list of family hotels in Bandung includes stays that cater for kids (with lots of attention lavished on parents too) so you can have that long-awaited family vacation! Time to enjoy the cold winter-like weather and snuggle in a comfortable bed sipping hot cocoa after an exciting day in all-natural playgrounds! 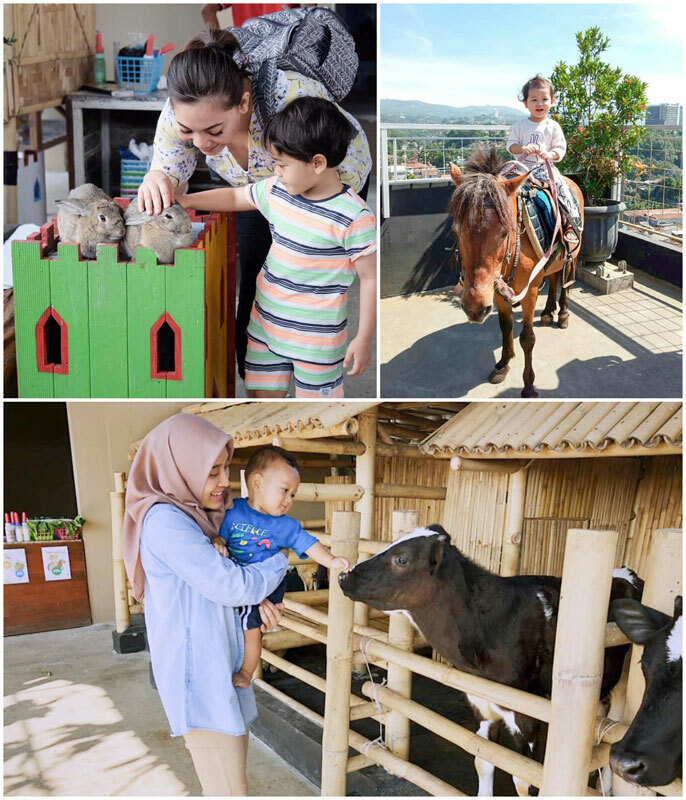 4D3N Affordable Bandung family itinerary with fun kids activities, sightseeing, cafe-hopping and shopping! Note: The prices reflected below are low season rates, and they exclude tax and service charges. Accommodation rates often change with room availability, and low or high seasons. We recommend double checking for the final prices before confirming your booking. Can we confess? This hotel looks like it’ll bring out the kid in you! The entire property from top to bottom is designed with kids and families in mind. 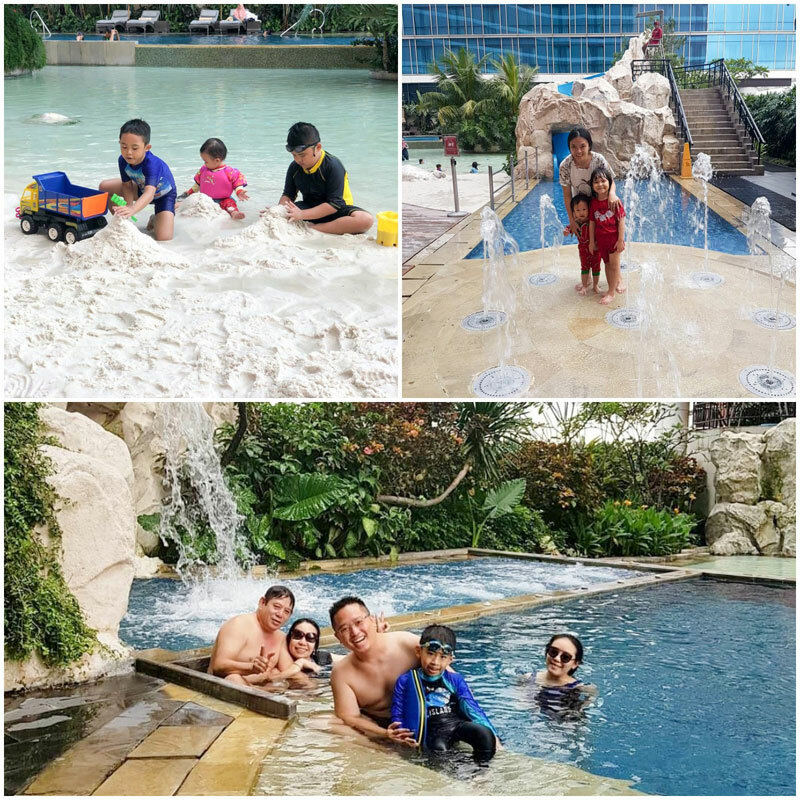 As a parent, you will love it because for a couple of days you’ll never have to tell your kids to “behave” or “be quiet.” At Grand Paradise Hotel, you can let them get all their energy out, have a blast, and never worry about disturbing someone because everyone else’s kids are doing the same. 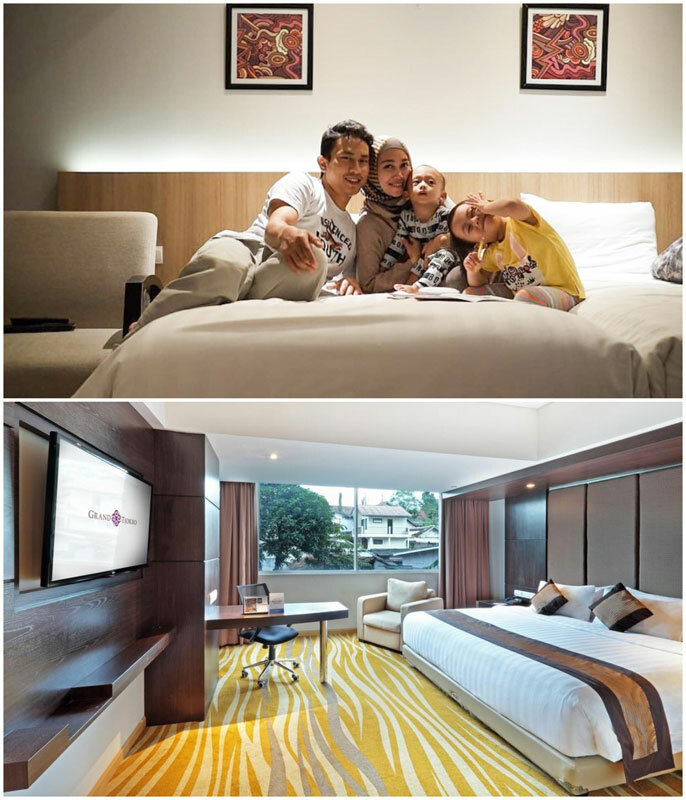 The stay prides itself as a “one-stop family entertainment”, and caters to your every need while on a family getaway. 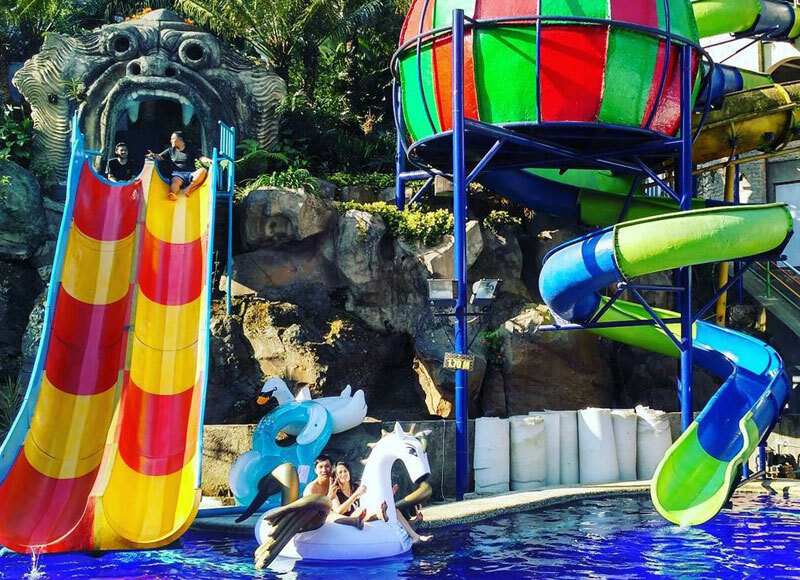 Checking in here means you get to enjoy a comfortable bedroom, a convenient on-site restaurant, as well as a thrilling waterpark with exciting slides and a heated indoor pool. Now tell us how can kids and parents not find happiness here? After a fun day at the mini waterpark or at the outdoor ATV area, don’t miss on a heart-warming dip in their heated indoor pool to enjoy relaxing jacuzzi facilities. Although the hotel doesn’t offer connecting rooms and family suites, they provide extra bedding to accommodate families with kids – a few words to the receptionist should do the trick! 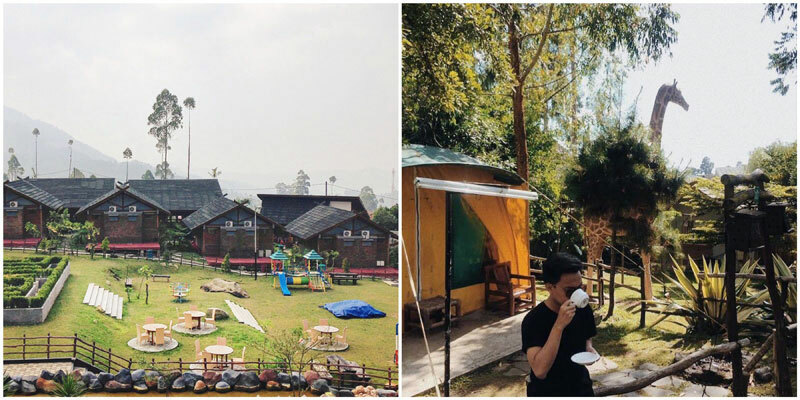 This place holds just as many adventures as you can expect to experience in Bandung. Enjoy a day out with the teens – you can climb the wall in a safe area while cheering each other on. Or challenge your kids to go rafting down the river – it’s a great opportunity to bond with the family over teamwork. 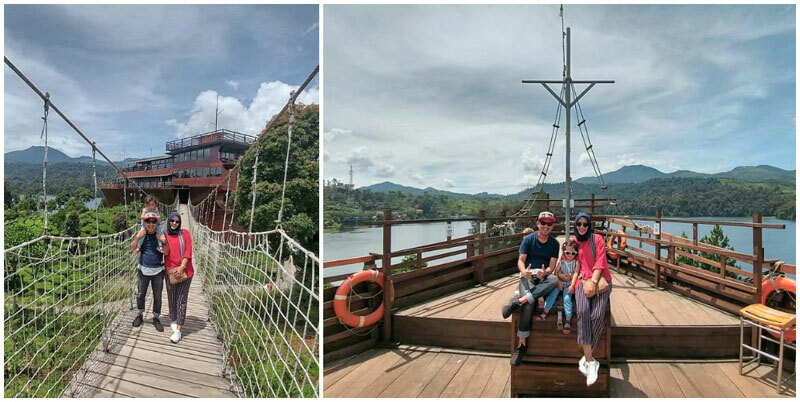 And fret not, this resort has its own portion of river that’s been tested for safety, so it’s definitely suitable for kids. 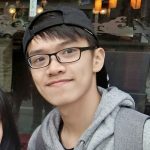 You can also start a paintball game! 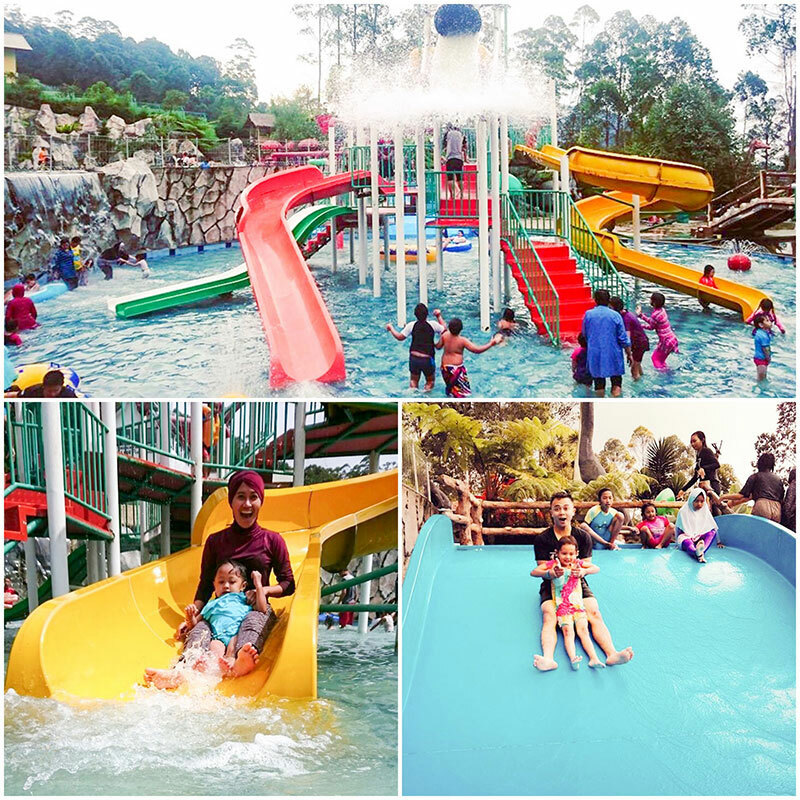 What’s a family outing without some splashes of colour and lots of fun and laughter? 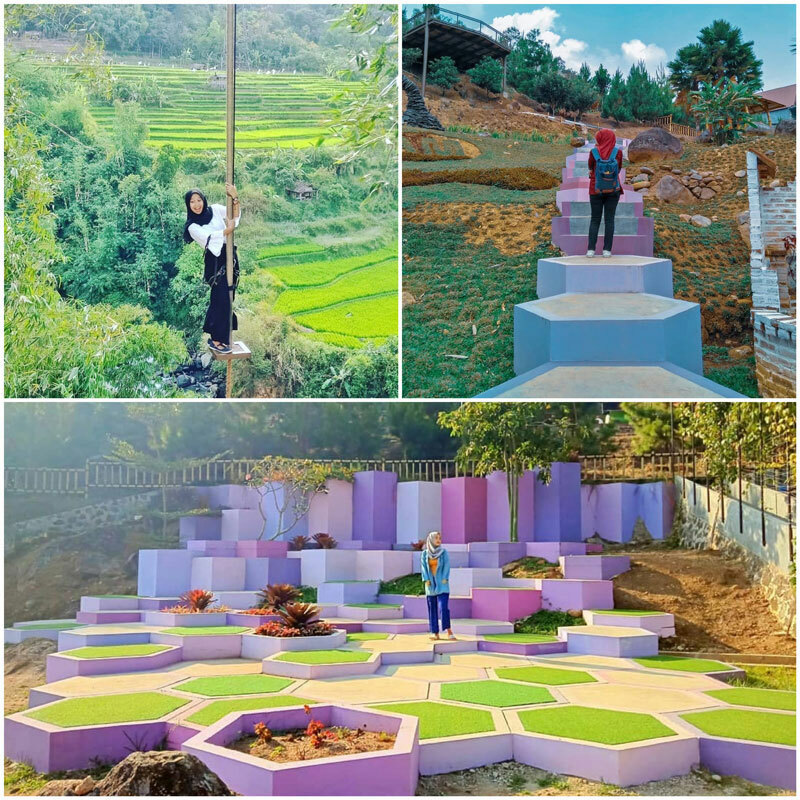 Take memorable and unique pictures on their scenic bamboo bridge or take a stroll in the purple garden that makes stunning images with the surrounding lush greenery! Feeling hungry? 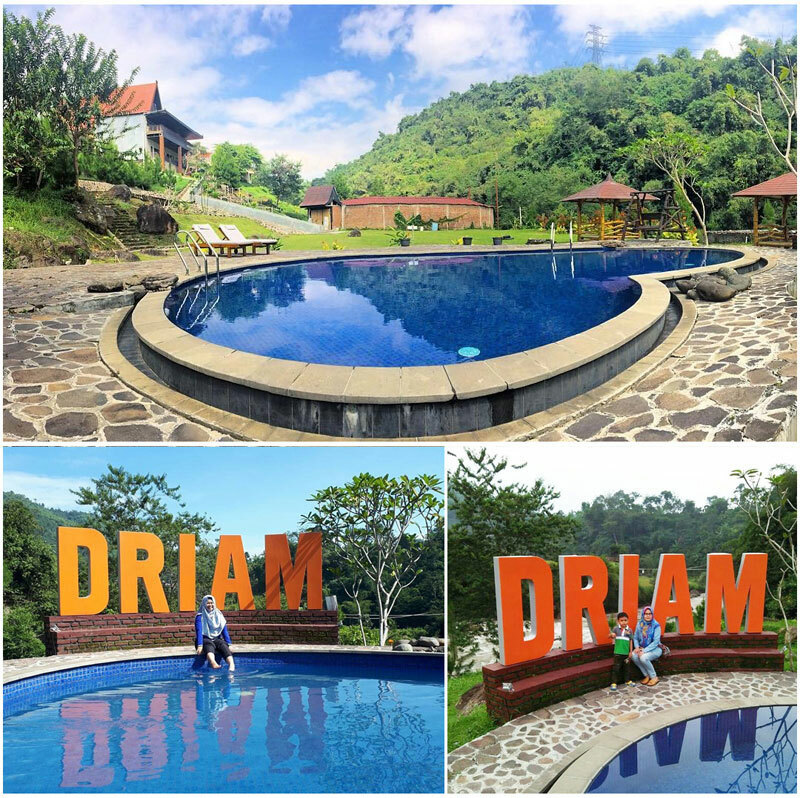 Take the whole team to D’riam food market and enjoy scrumptious meals with the lovely views of the rainforest and river. 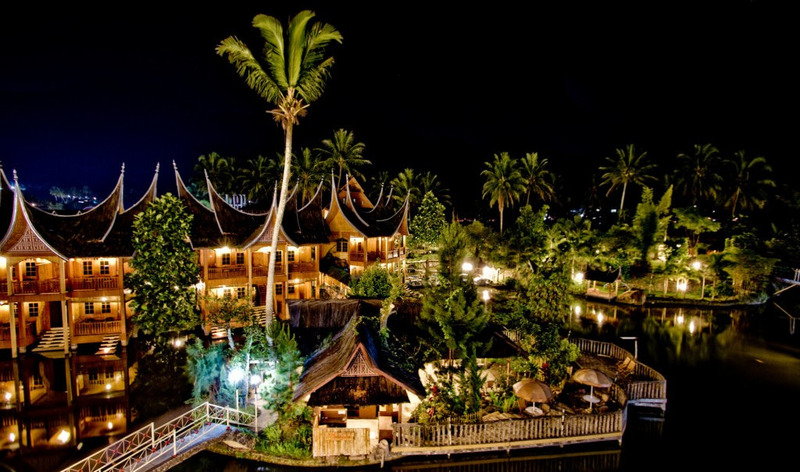 Terminal Wisata Grafika Cikole is not just a resort; it is a whole destination of its own. Not only are there attractions and activities, but you can also spend a night – what a bonus! 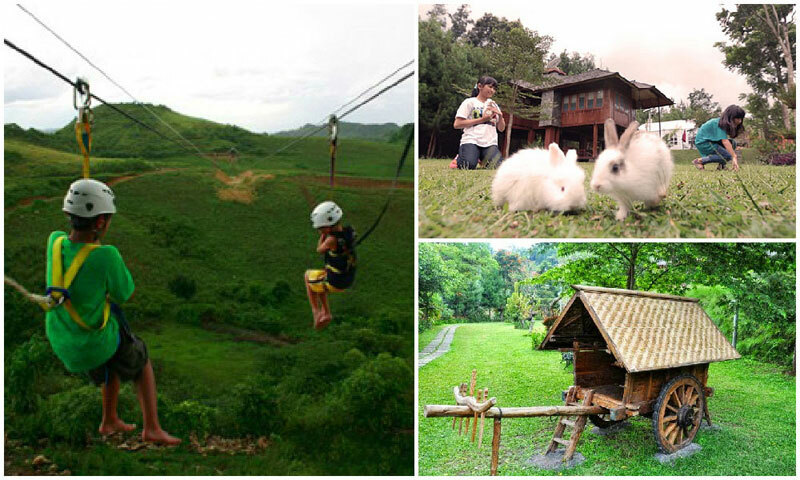 All your kids will worry about is not having enough time to explore every adventure this place has to offer! Outbound site and a treehouse? How can a kid not get excited? 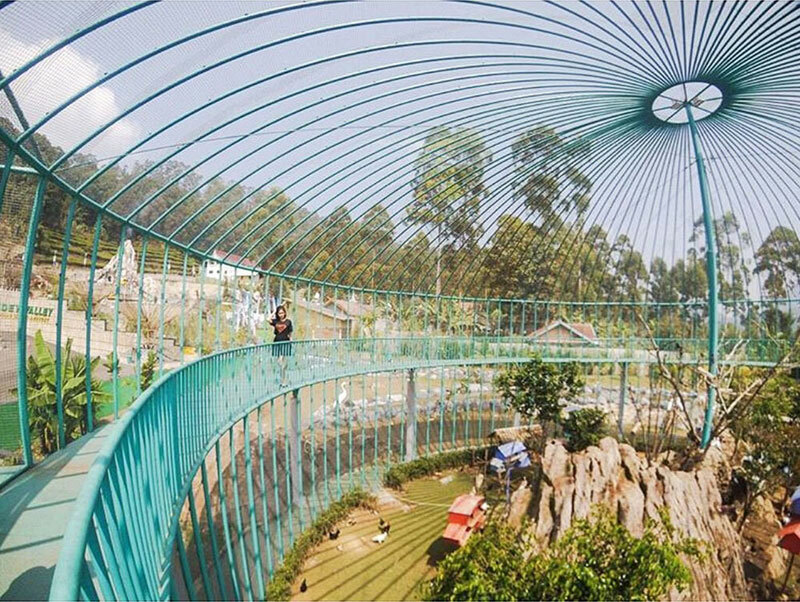 If you step a little further, you can find a strawberry farm as well as a jungle to trek in. And guess what, even the accommodations have awesome options – you can choose one of the eight hotel rooms or take the villa, or even camp at the campsite! Located in a valley between Mt. 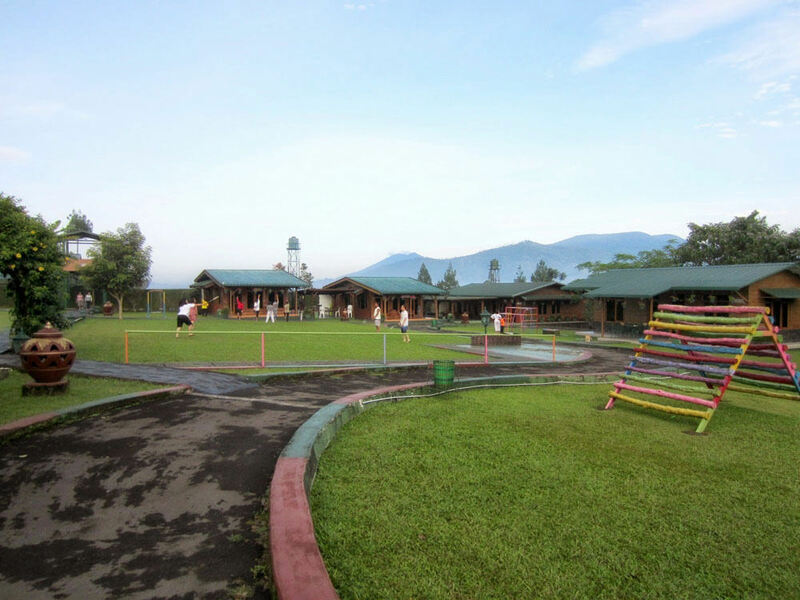 Burangrang and Mt. 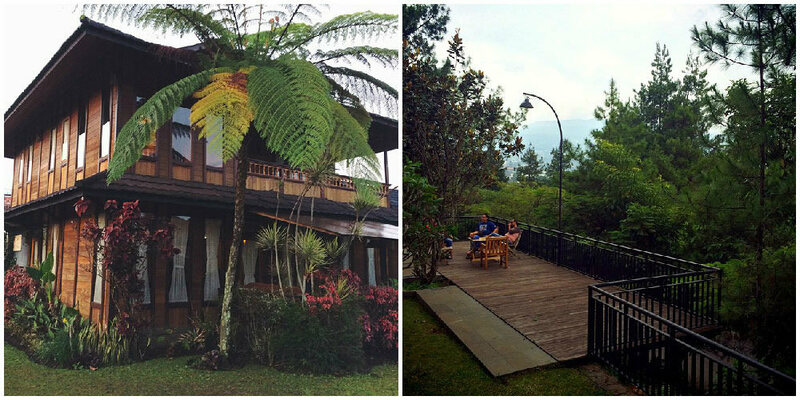 Tangkuban Perahu, Vila Air is the ideal retreat from the heat and the busy city. With rates starting from only USD $190 for a room for six people, this is the perfect choice for you and your friends or family! With its open-air design and private terrace for each villa, the place feels like it’s made for tranquillity. 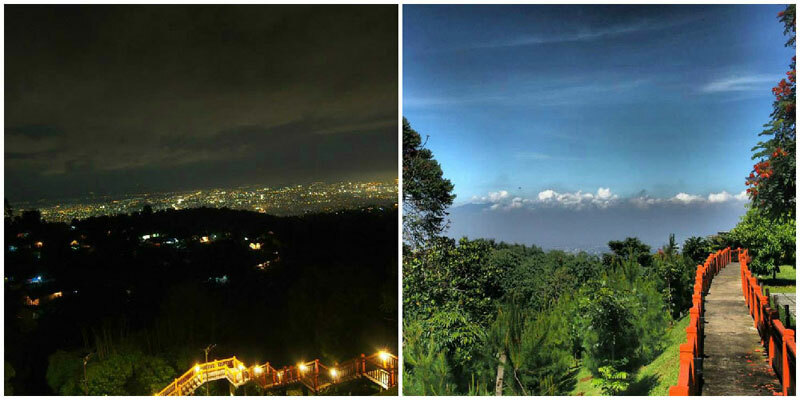 From your villa, you can also overlook the panoramic vistas of the Tangkuban Perahu Mountain. Kids innately love nature. All you need to do is to expose them to natural landscapes when they are young! And where better to do it than an at outdoor camp? Well, in a tent with the comfort of a luxury hotel! 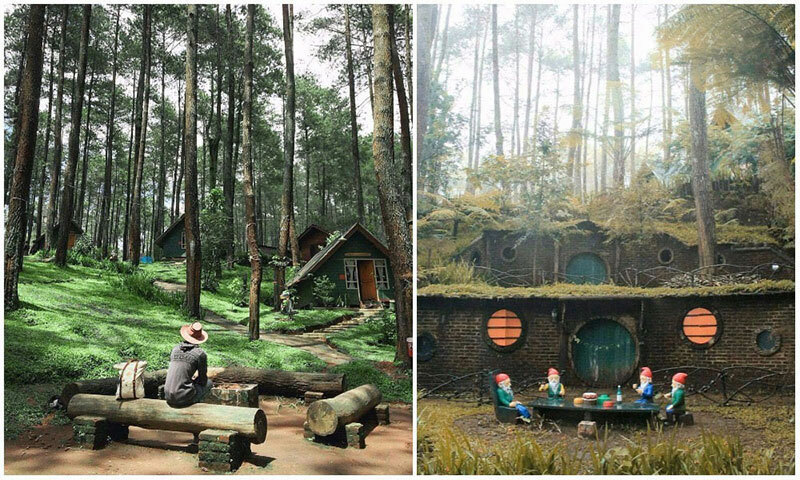 You can do just that at Legok Kondang Lodge. 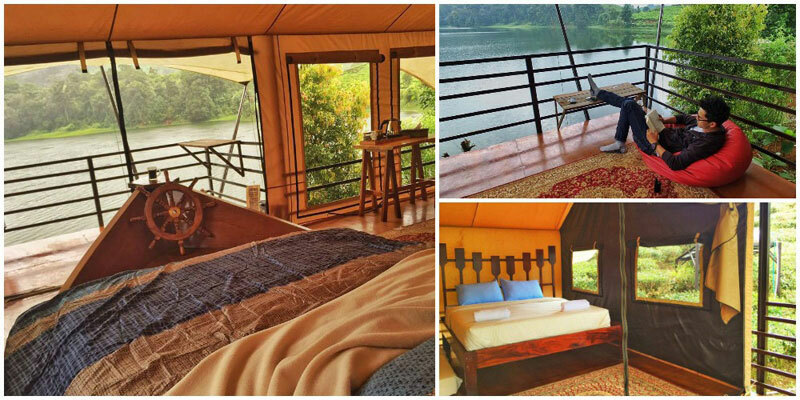 Here, each tent is furnished with plush bedding, fluffy pillows, thick blankets, television and a private bathroom! 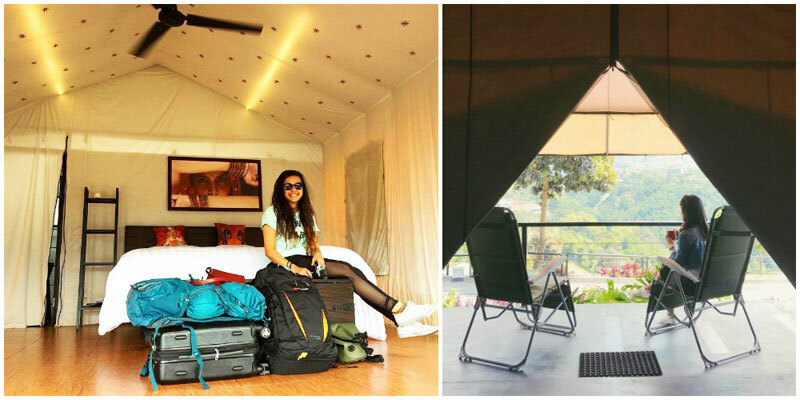 The tent is not the only amazing thing in this lodge. 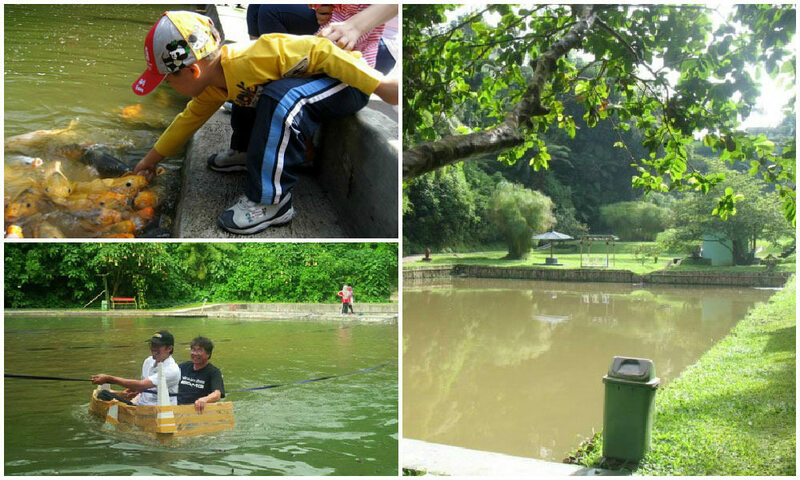 Your kids will love all the exciting activities designed to make them fall in love with nature. 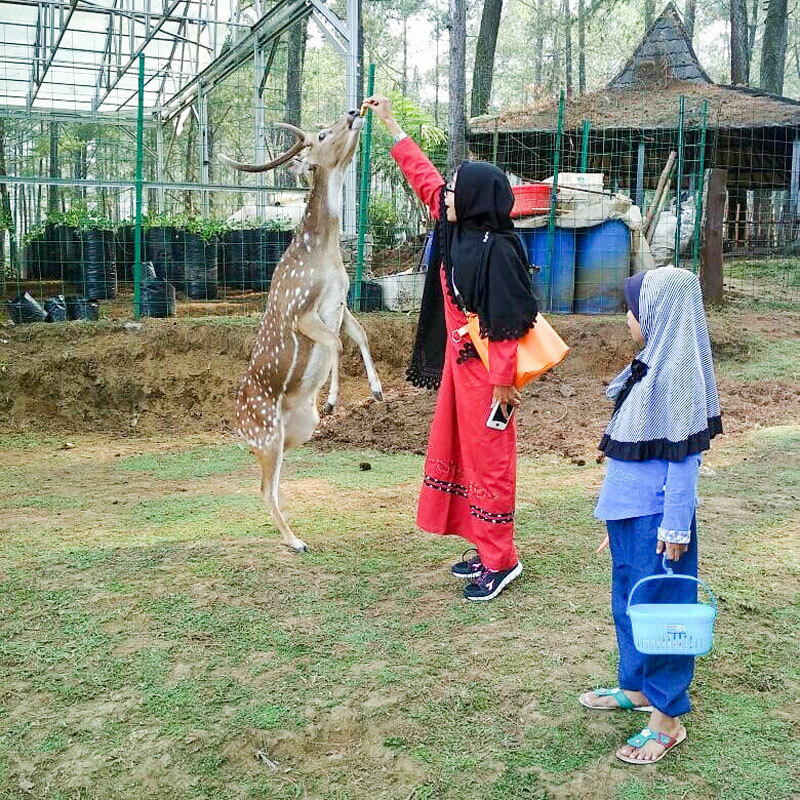 Try fishing with bare hands or feeding cute rabbits and deer! 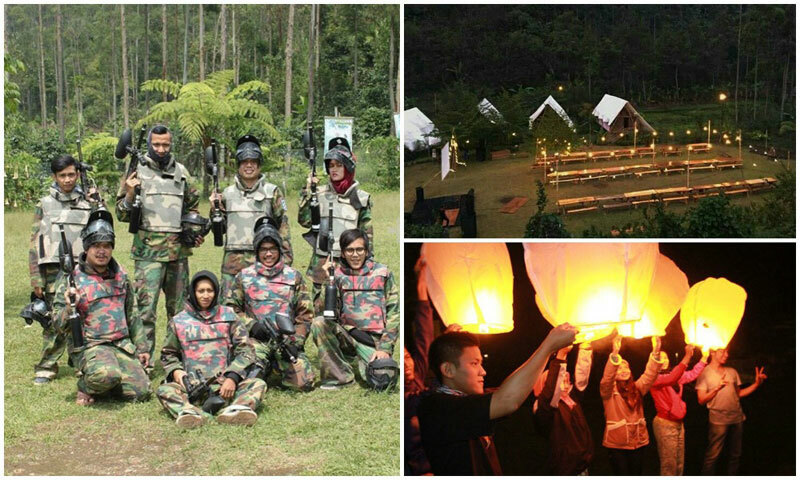 As for adults, get your adrenaline rush through outdoor adventures such as trekking, rafting or paintball. And at the end of the day, simply unwind together by the bonfire while munching on the delicious barbeque dishes! With temperatures generally ranging from 15° C to 20° C, you can be sure the weather is lovely and chilly. 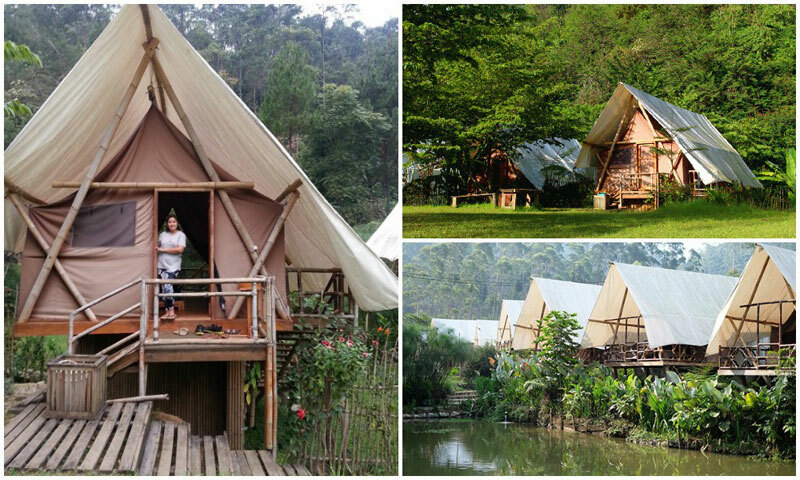 Glamping Legok Kondang is located 700 metres away from the nearest village, and there are different categories of tents you can choose from, depending on the luxury level you prefer! 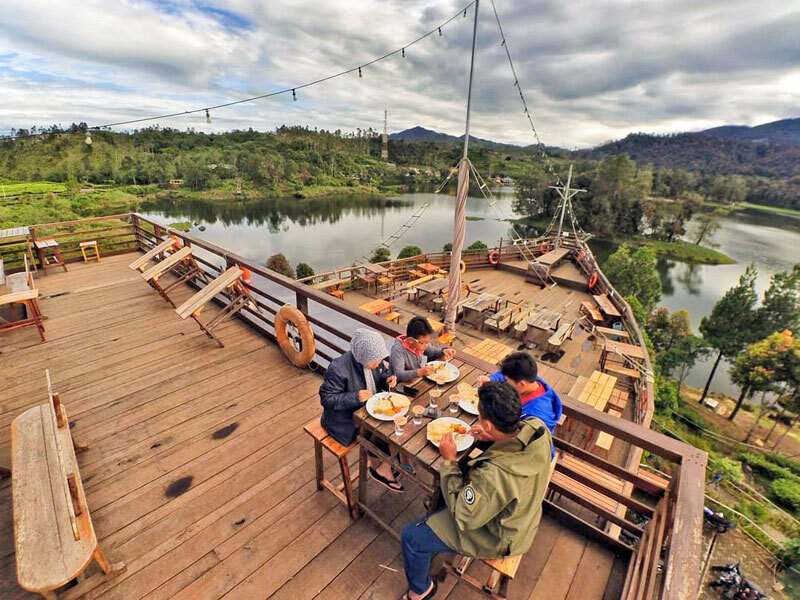 Remember Phinisi Resto in southern Bandung, the unique family friendly restaurant inspired by the traditional Bugis-Makassar ship, where you can dine with breathtaking views of peaceful Ciwidey in Bandung? 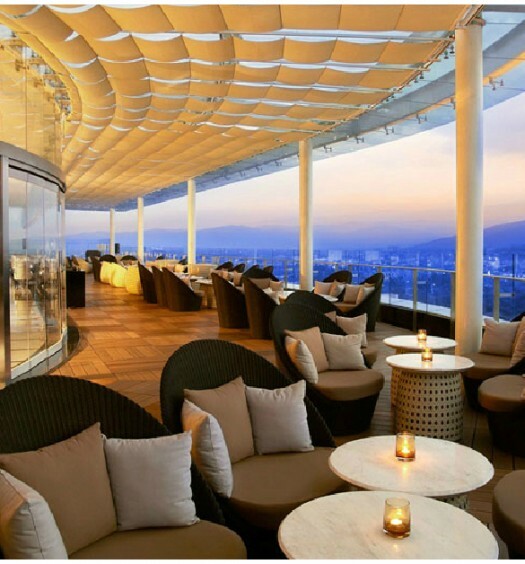 Phinisi Restro consists of both an indoor and outdoor area. 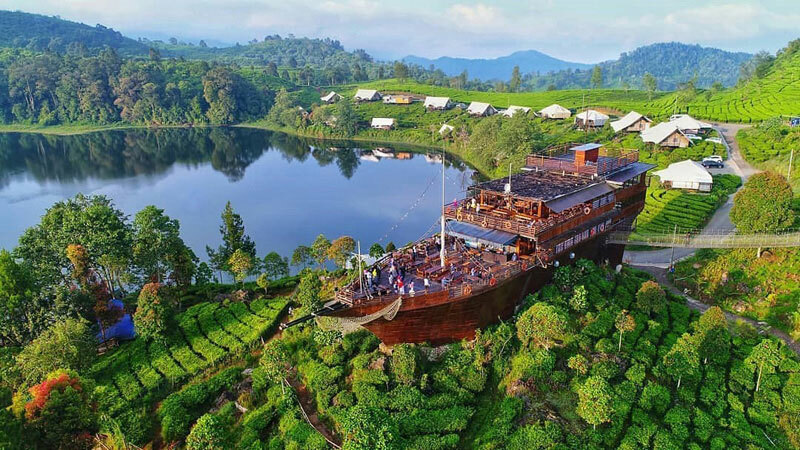 Sit in the outdoor area to enjoy the beautiful stretch of panoramic tea plantation and the soothing view of Situ Patenggang Lake. Your kids can even pose as pirates on the deck with the steering wheel! 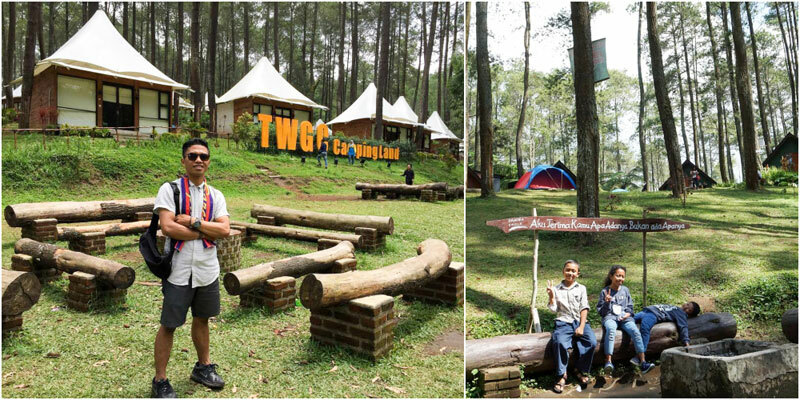 And guess what, this cool restaurant is situated in the same area with the trending Glamping Lakeside Rancabali. 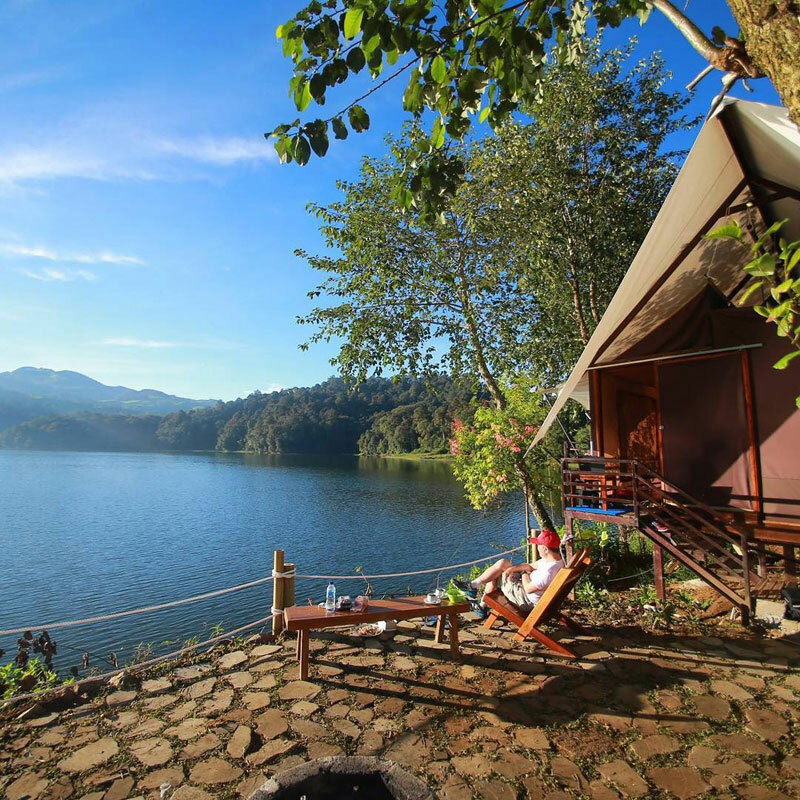 You can spend the night in the luxurious tent with the most complete facilities by the lakeside of Situ Patenggang. 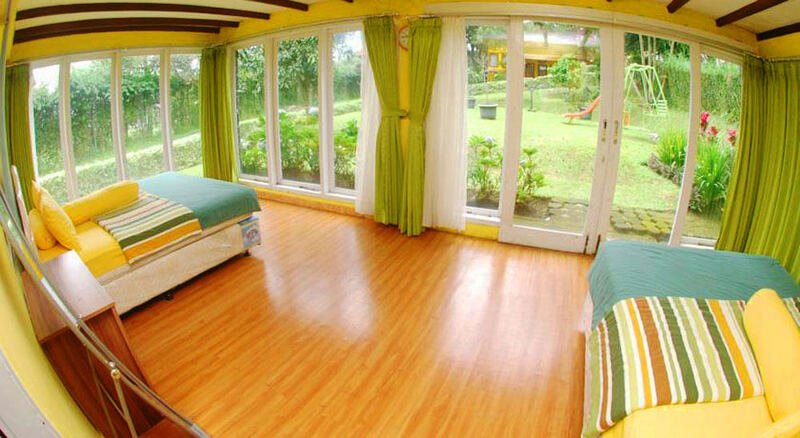 Imagine waking up to the spectacular view and enjoying fresh cool air all day. 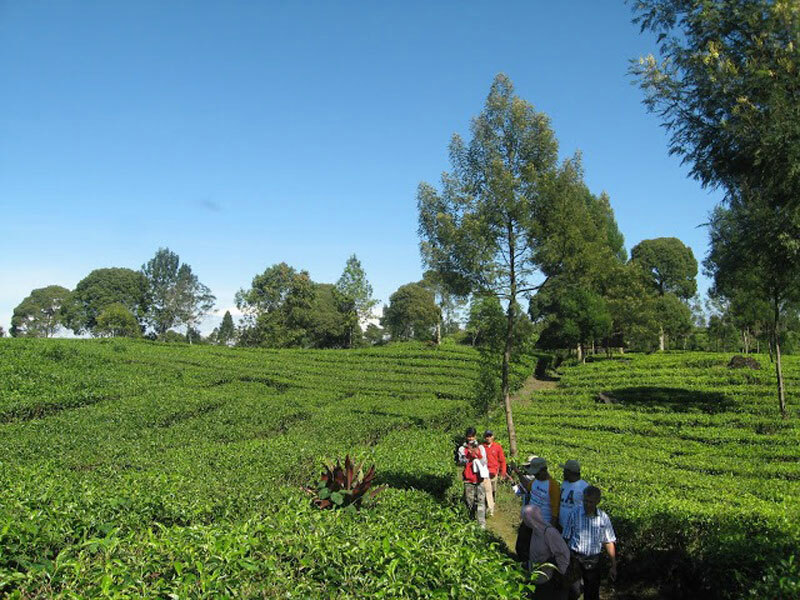 As an inhouse guest, you can stroll around the tea plantation (known as their “Tea Walk”). 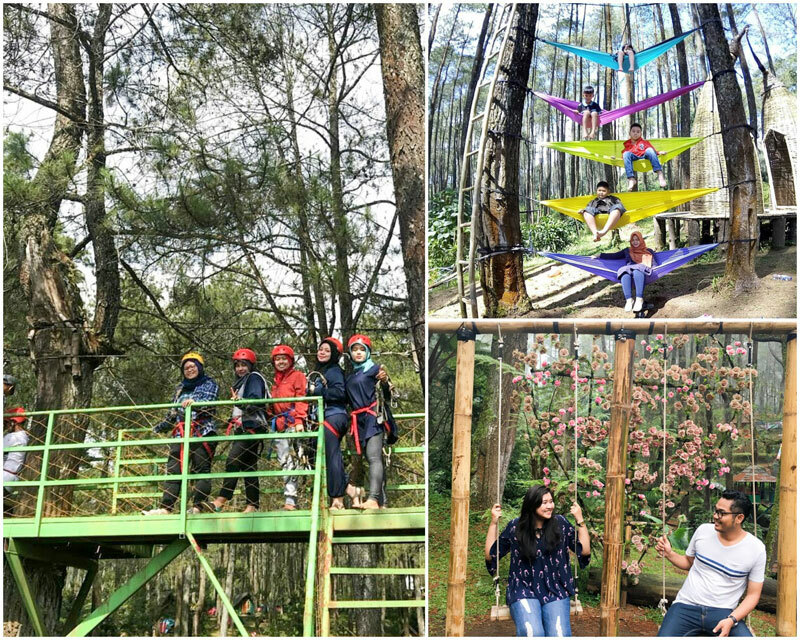 You can also participate in other exciting activities such as paintball, rafting, touring Kawah Putih, and even off-road adventures, and they are all pretty affordable! Tired of the same old sights of the city? 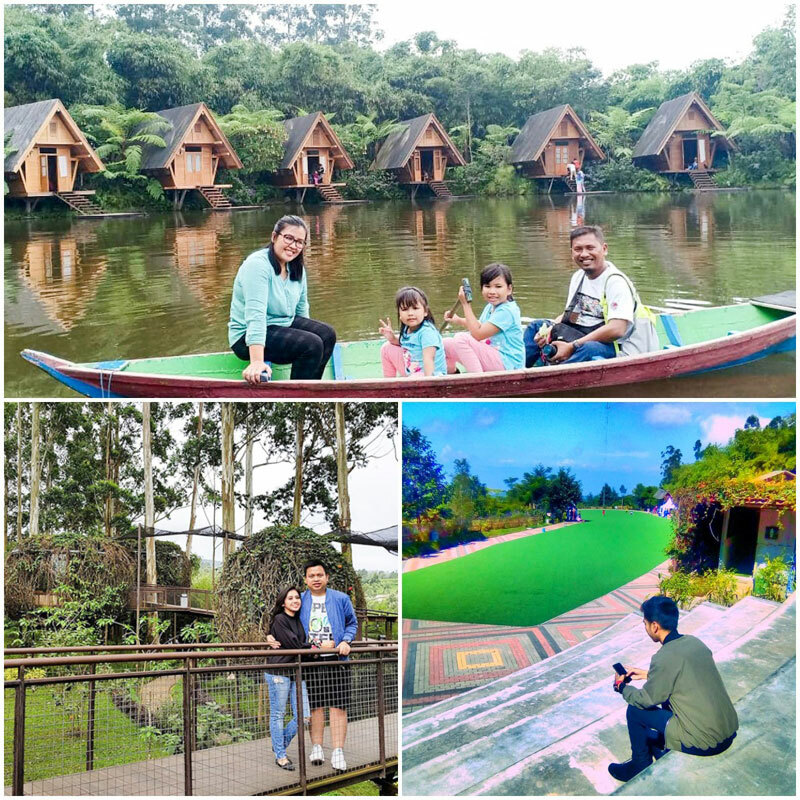 Nestled atop a hill in Lembang, Dusun Bambu Leisure Park offers a view of lush greenery and crisp mountain air all within the comforts of modern architecture. 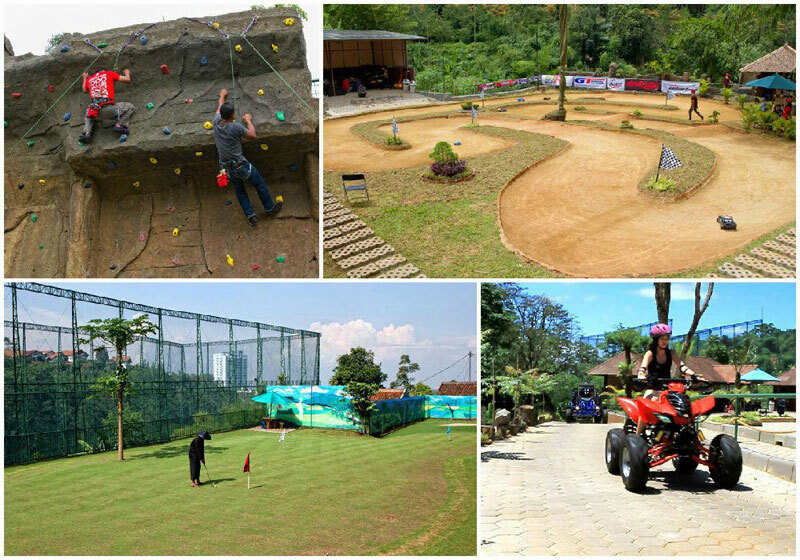 Covering 15 hectares of land, children and teens can roam freely in the beautifully manicured gardens and playgrounds or take part in the many activities ranging from pottery, mini golf, a hot air balloon, and even a shooting range! 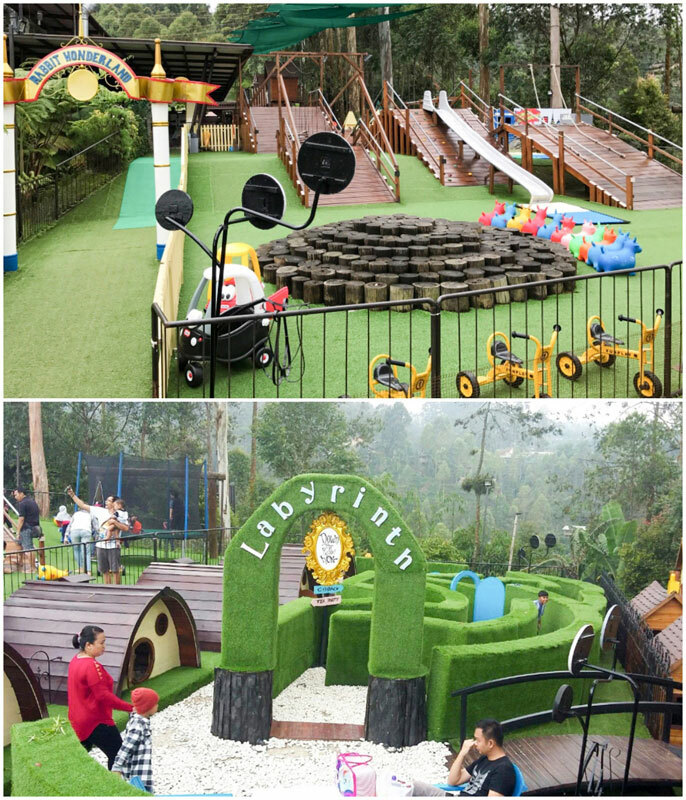 Recently, they also added The Labyrinth – a new attraction designed to let your kids truly play on carpeted ground in slides, mini houses, tunnels and more to their hearts’ content! 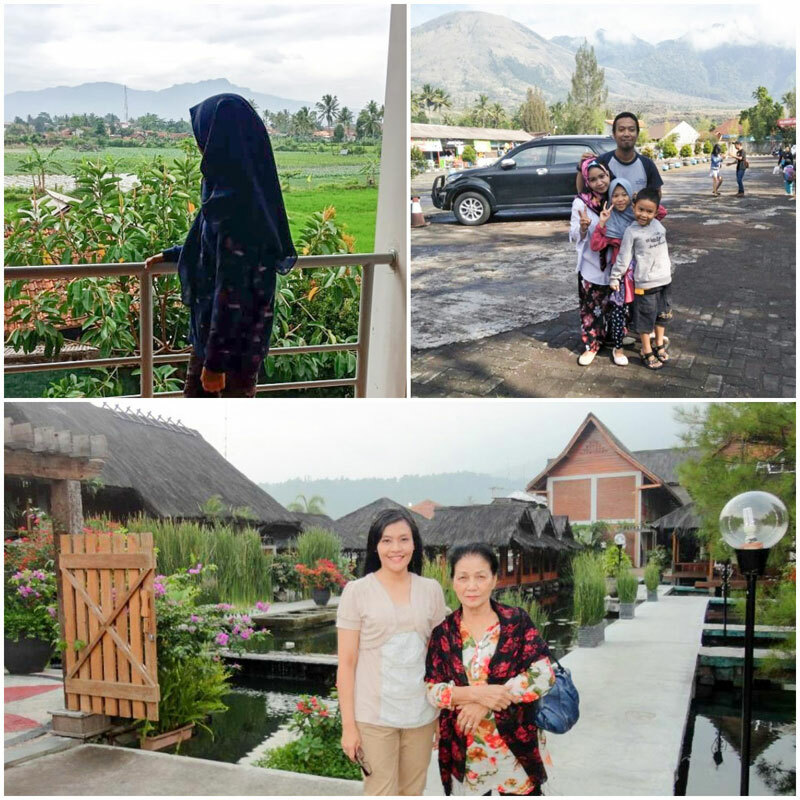 For food, families have three restaurants to choose from – you can enjoy a private lunch at Lutung Kasarung in ‘bird’s nest’ cabins hanging on pine trees, taste traditional Sundanese cuisine at Purbasari in lakeside gazebos, or dine with a view of Mount Burangrang at the Burangrang Café. The Pasar Khatulistiwa market is also available for guests who are looking for light snacks, vegetables, and souvenirs. 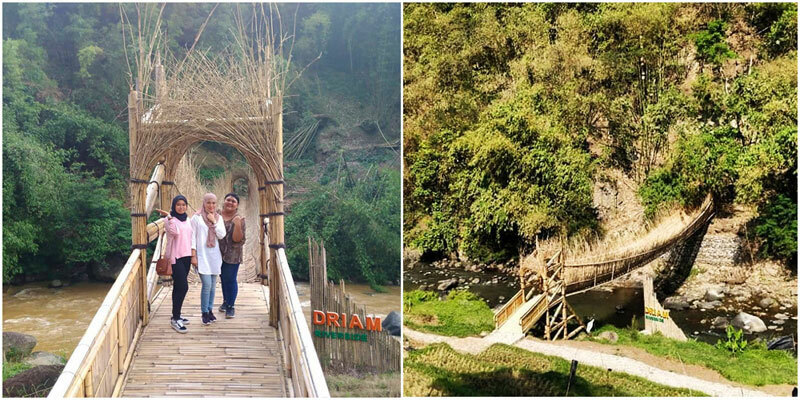 Not enough time to try out all the attractions at Dusun Bambu? 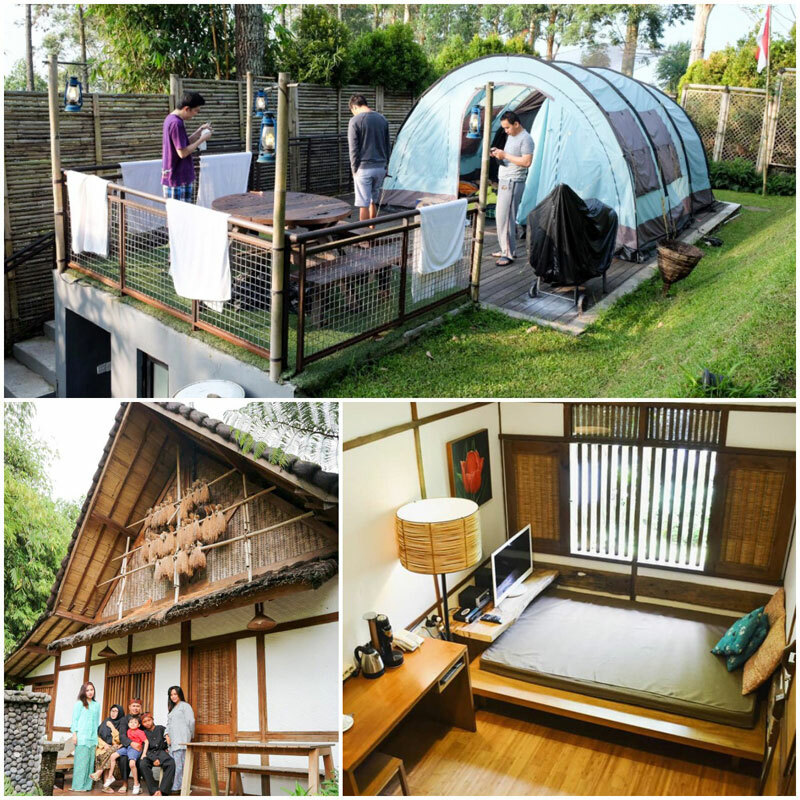 How about spending the night at the Kampung Layung Villas complete with your own butler? 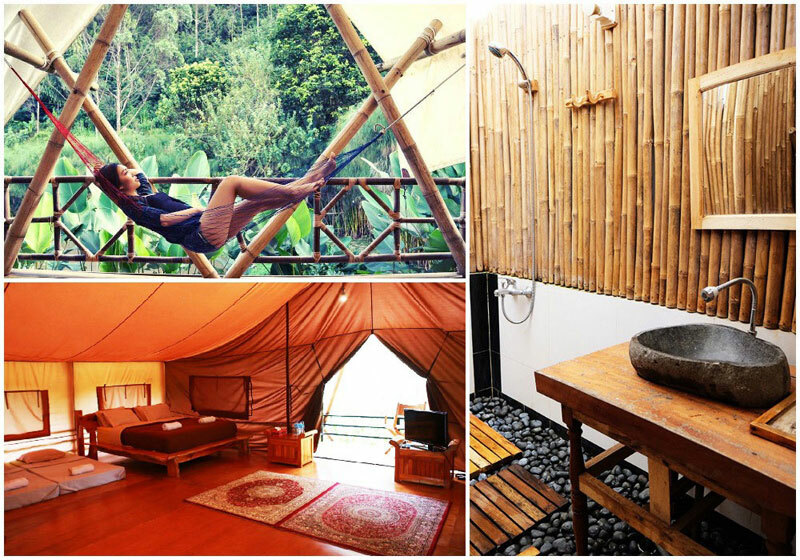 If you’re feeling a bit more adventurous, go ‘glamping’ at the Sayang Heoulang (Eagle Camp) – get closer to the outdoors in comfort! 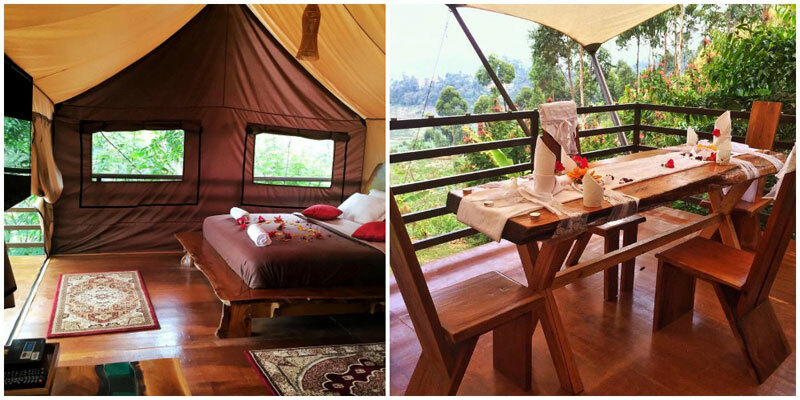 Glamping? Now it’s glamping with a view! 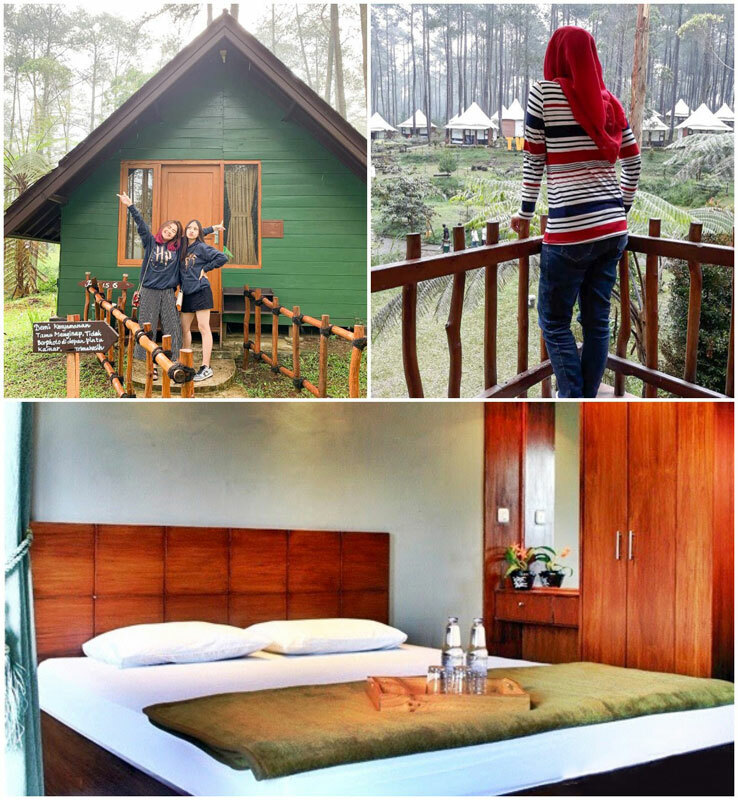 At Trizara Resorts in Lembang (45 minutes’ drive from Bandung’s city centre), you can relax in the luxurious tents with fully equipped bedding, bathroom and facilities. 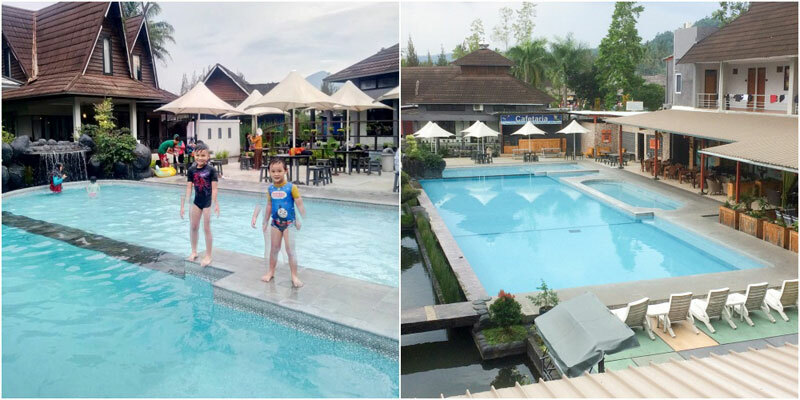 If your kids love playing in the water, they can do so at the resort, where they can indulge in the gorgeous green surrounding and lovely chilly weather. The most recommended time to swim here is in the mornings or afternoons because it gets pretty cold in the evenings. 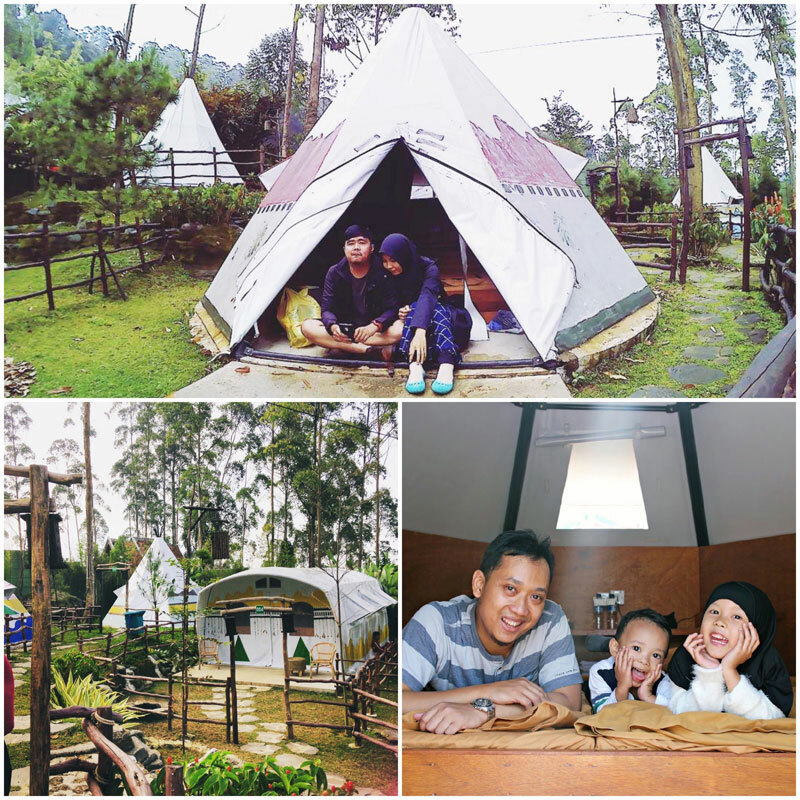 Other than their unique tents, Trizara Resorts also redefines family sunset time! You can gather around the bonfire while singing along to camping songs. Doesn’t that remind you of your old school days? 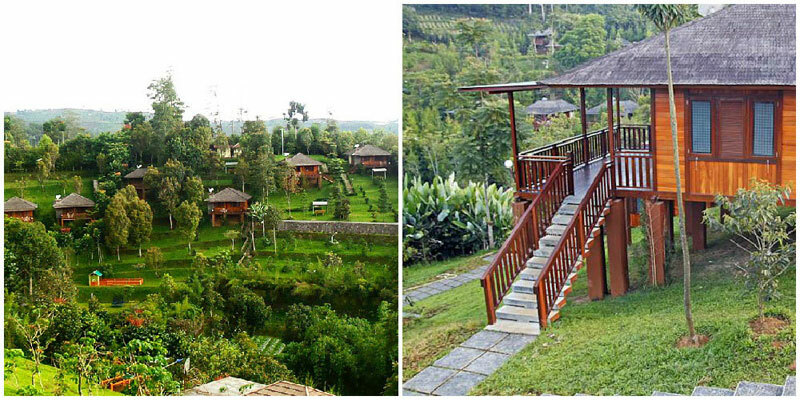 Alternatively, you can picnic in the huge park, do yoga or simply lose yourselves in the cool atmosphere of Lembang. 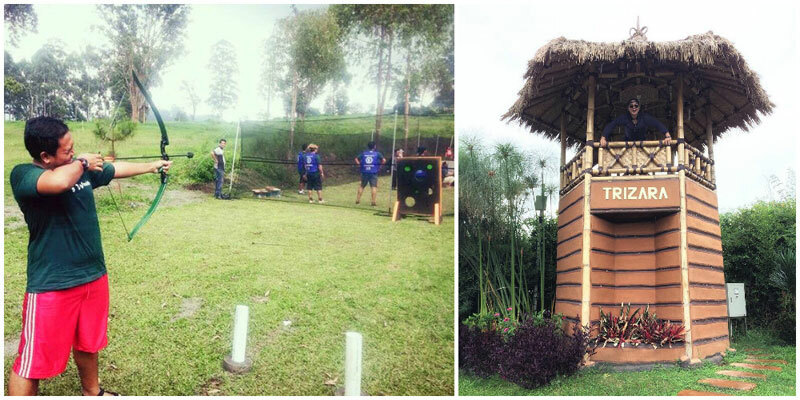 Staying fit during your holiday also gets super easy with their sports facilities such as biking, archery, and more! 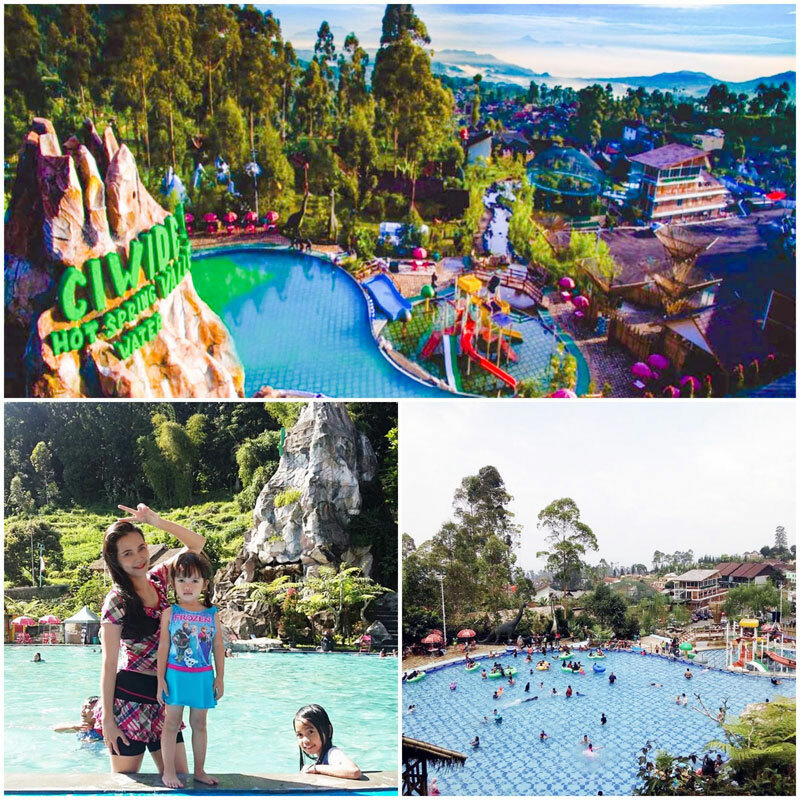 Thinking of visiting Ciwidey Valley Waterpark Resort? 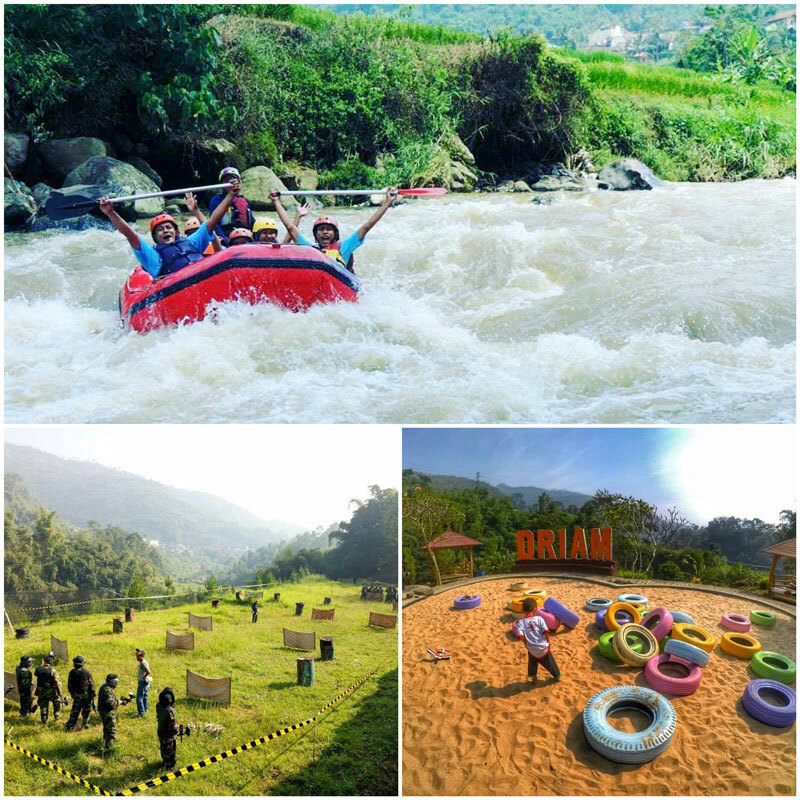 Come with maximum energy, as you will need it here with the plethora of fun things to do – guaranteed to make you feel like a kid once again. 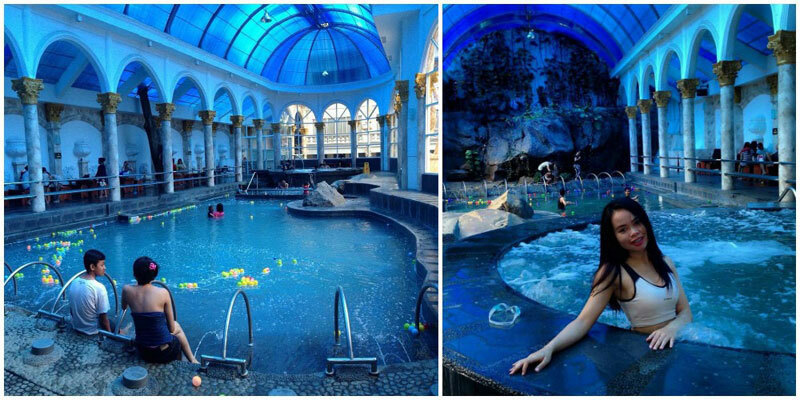 If you’re not big on swimming, parents can laze in the pool – with natural hot spring water flowing from statues into the pool to ease your aches away! And if your children are hyperactive, don’t worry. Let your children run around and have fun, as you relax in the lounge with a refreshing iced tea. After running around all day, your children will be tired out, and that only means a good night’s sleep for the parents! 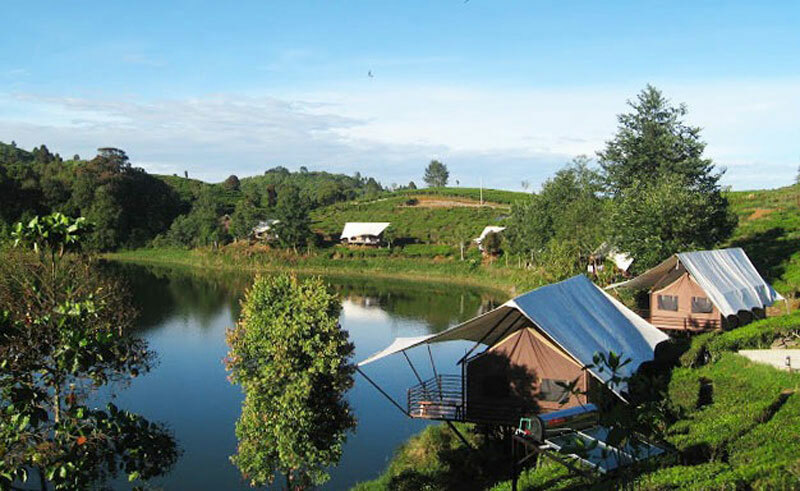 For an authentic outdoor experience, the resort also provides Indian camping tents for rent, at their camping grounds. Lastly, apart from staring at the starry night sky, one of the most heartwarming things to do here at night – would be to have a jolly old bonfire complete with marshmallows. Your kids (and yourselves, of course) will treasure the memories made here for life! 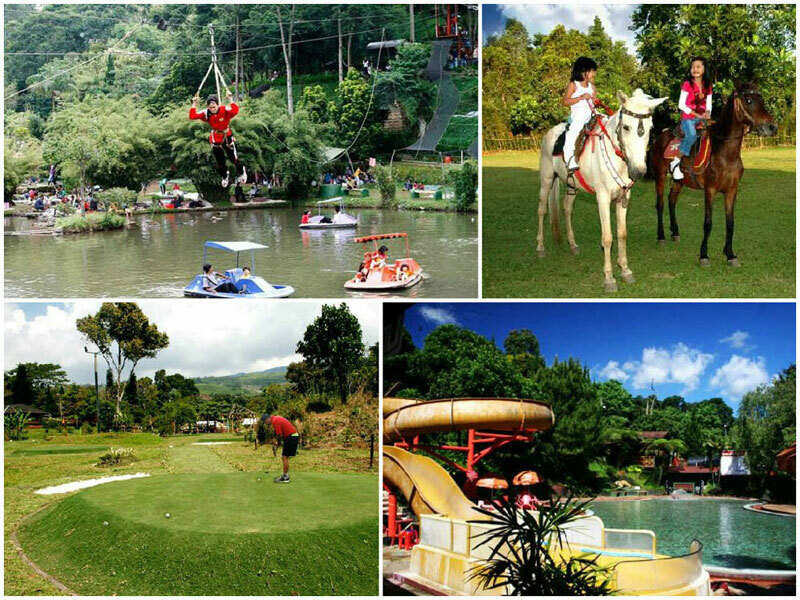 At this resort, fun starts at the recreation area for family, with flying fox, horse riding, kids’ pool, playground or even golf for daddies. 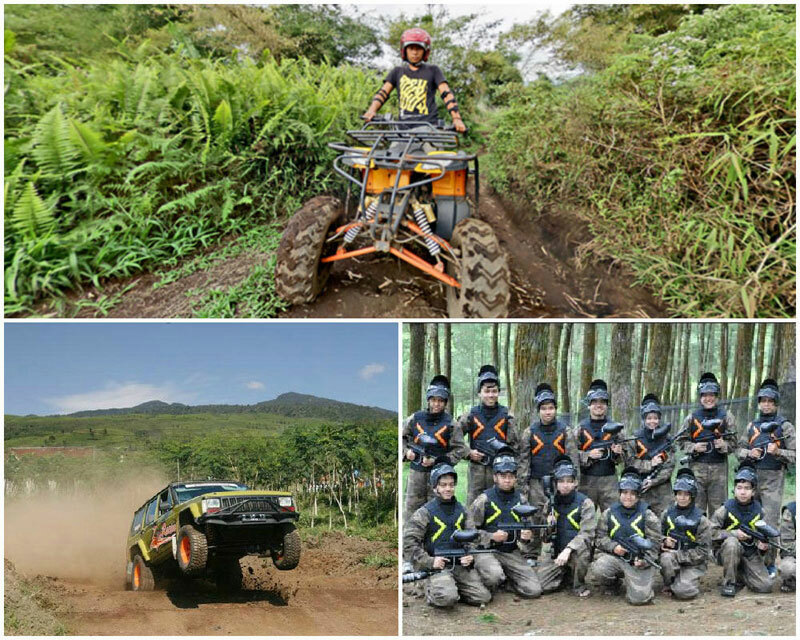 If you’re feeling more adventurous, you can try off-road journeys in jeeps, ATV or let loose in the paintball arena . Who says you can’t go wild and crazy with your little ones? 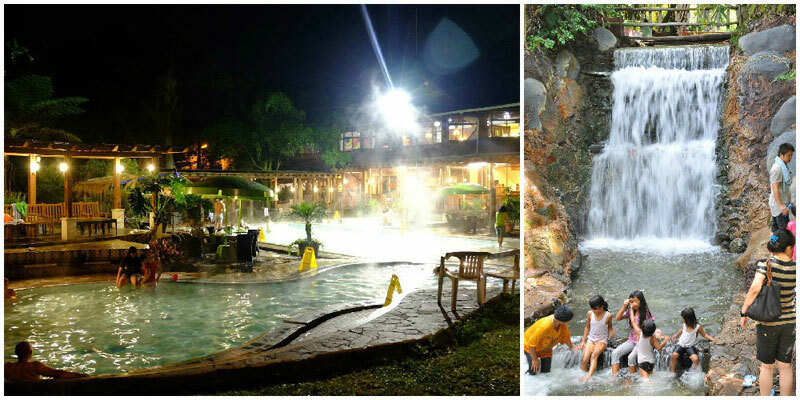 For some peace, you can retreat to the hot water spring, which flows right from the volcano. It comes with numerous health benefits and utmost relaxation. 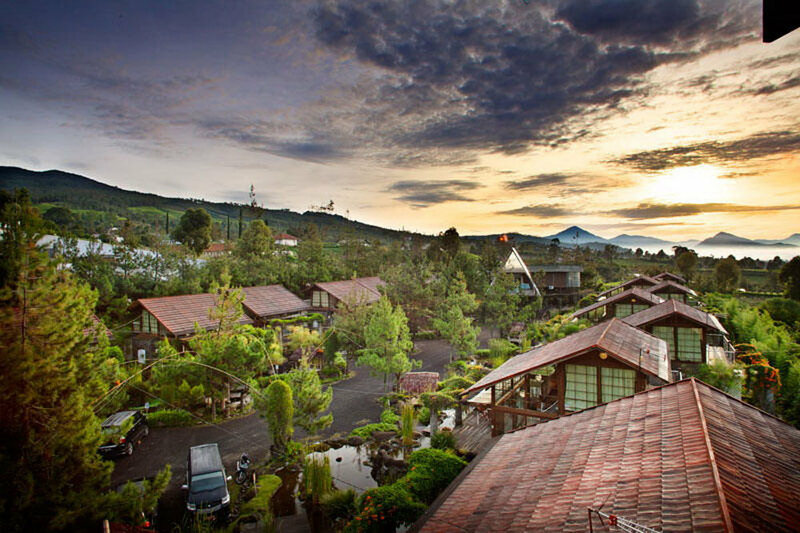 Sari Ater Hotel & Resort provides 10 resort types you can choose from, including family suites that can accommodate up to 10 persons, where you can have your own kitchenette to whip up delicious suppers! 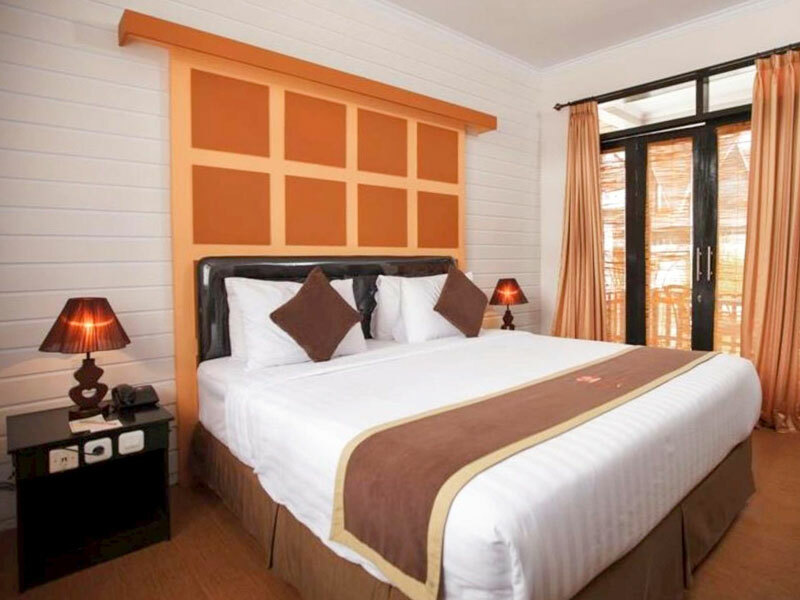 Kastuba is a perfect escape from the noisy and polluted city – a quiet getaway where you can neither hear nor smell the traffic, but can still enjoy the city scenery from far, far away through your resort window – so you get the best of both worlds. You can find adventure in the day with outdoor activities’ facilities and snuggle with your loved one at night by the fireplace (which is in every villa) to warm you from the cold night air. If you want to impress your loved one even more, request to set up a romantic dinner outdoors too. Spoiling your kids doesn’t have to involve expensive toys or sophisticated new gadgets. 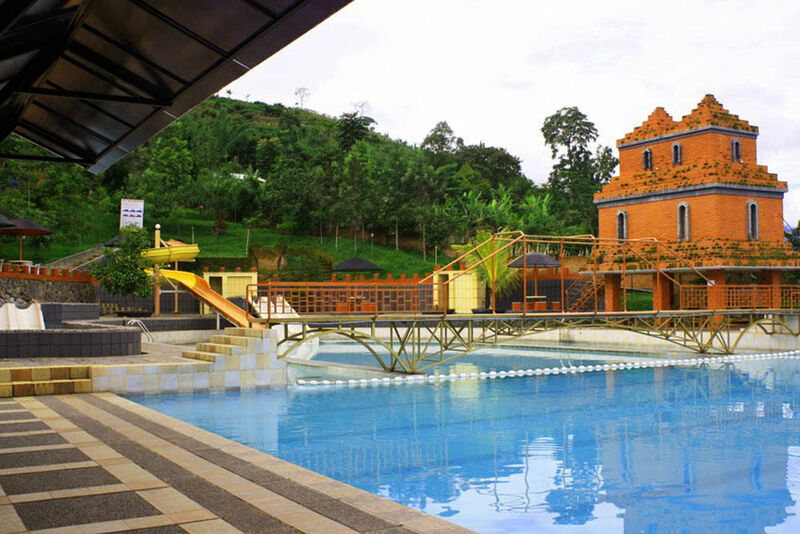 Instead, why not give them a pleasant, pampering experience of roaming around this spacious resort with fun activities all around the corner? Playground, indoor and outdoor pools, Kids Club… All’s designed to keep your kids entertained and happy. 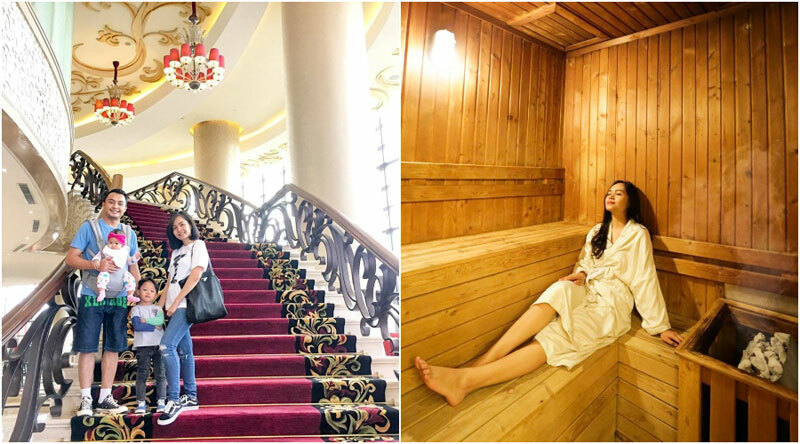 And while they’re kept busy, it’s time to indulge yourself in the beauty centre, spa and sauna, and be assured that your kids are well-taken care of! 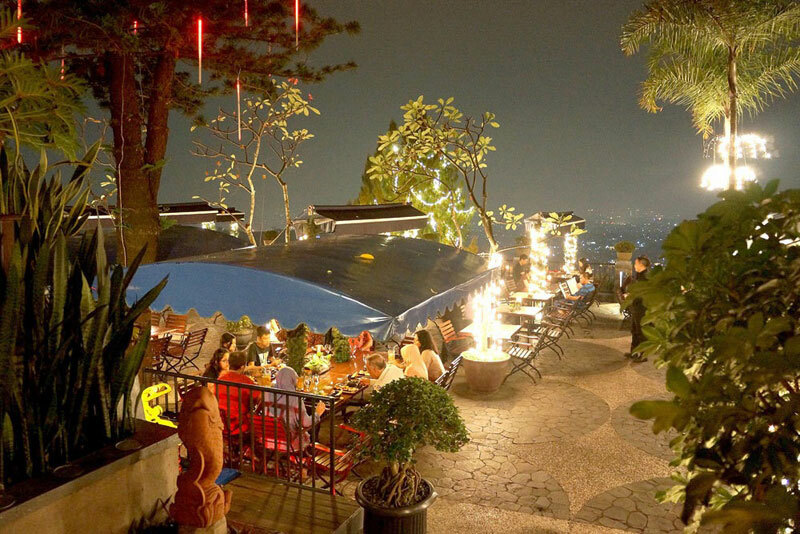 You can dine at The Valley cafe too, which is touted as one of the best restaurants with a view in Bandung! 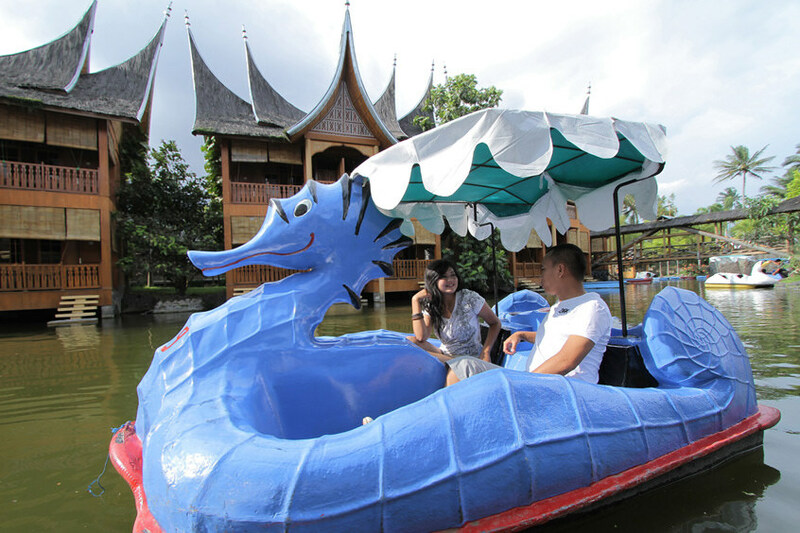 Also a great place to enjoy an intimate family outing and spend quality time together. With the selection of 18 villas of up to 3 bedrooms, any villa you assign yourself to comes with an extraordinary swimming facility, including a whirlpool everyone can enjoy. A very natural-looking wooden villa is complemented with a tropical garden where you can take a relaxing afternoon stroll, while the kids are free to dash around happily. It’s amazing how nature can bond a family together. 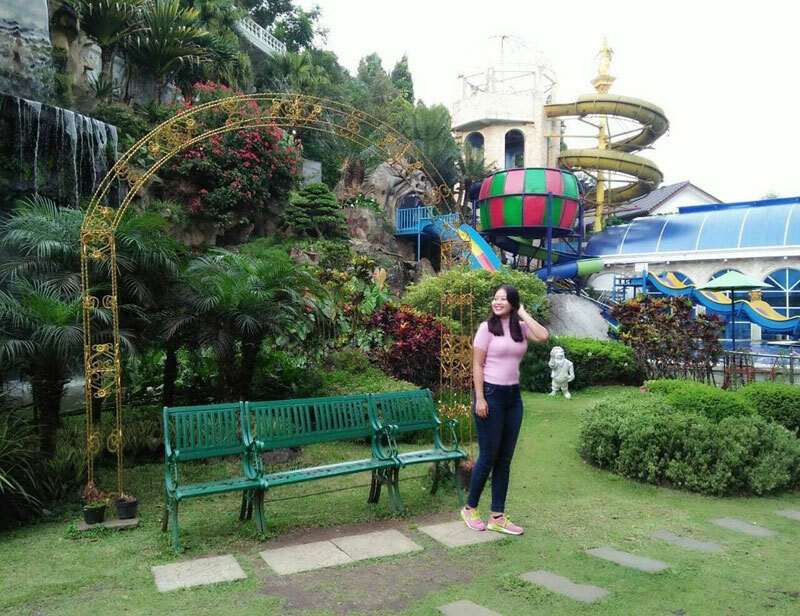 Maybe it’s the relaxing atmosphere, or the calm nuances where everyone can experience a tranquility in mind and emotion, breathing the same fresh air and looking at the same pristine beauty. 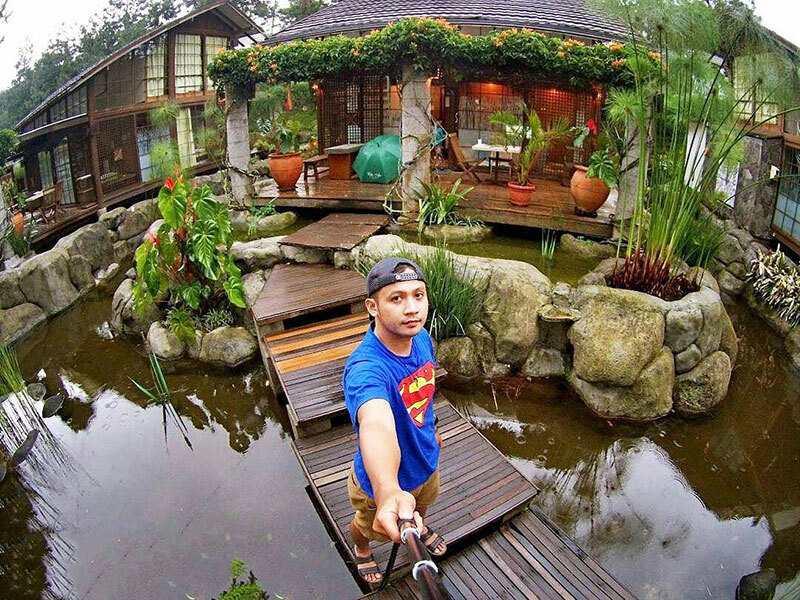 Kampung Pa’Go can provide just that, with its preserved natural habitat. 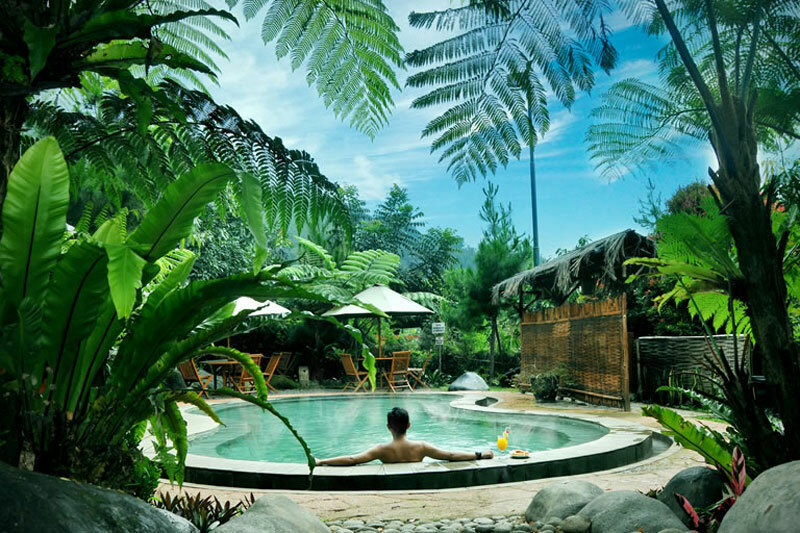 Various plants and vegetation as well as fresh fruits (which you are free to pick) will welcome you as you begin your expedition into the greeneries of Kampung Pa’Go. After the green comes the blue-ish big pool with a water playground for kids where they can splash around and have fun. 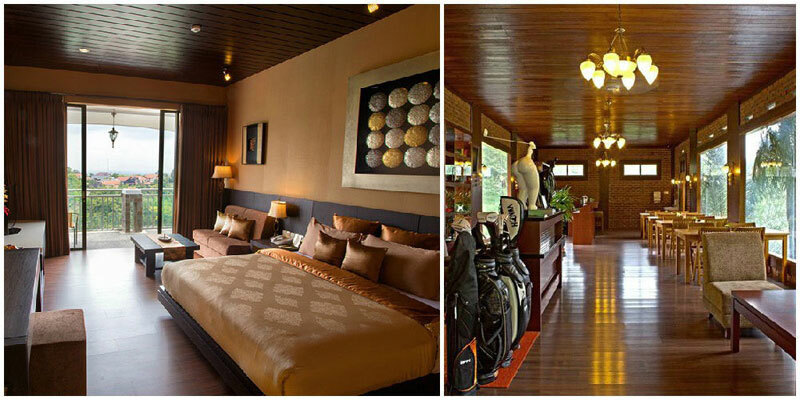 You can choose from 33 rooms in different types of accommodation, according to your family size and needs. 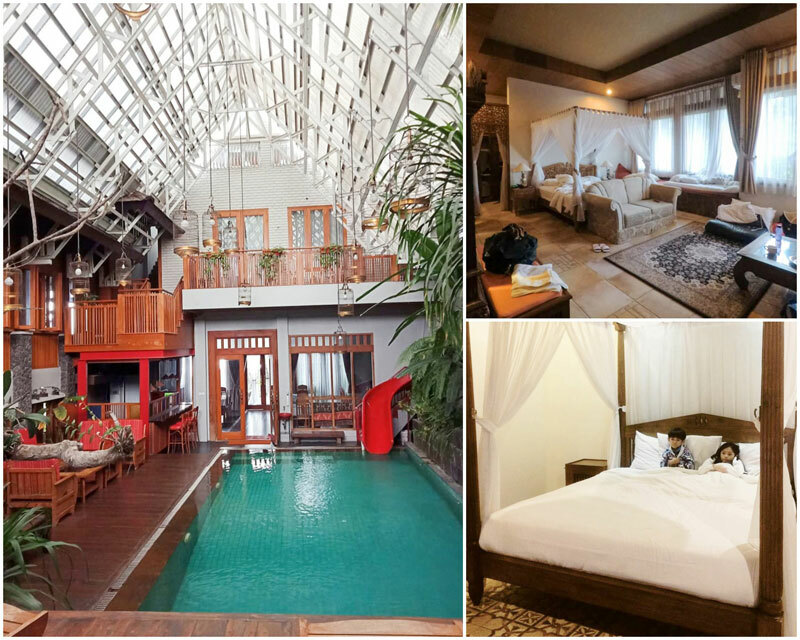 If you want something more exclusiveness with greater privacy, choose Rumah Bali, where this 2-storey resort is entirely yours. 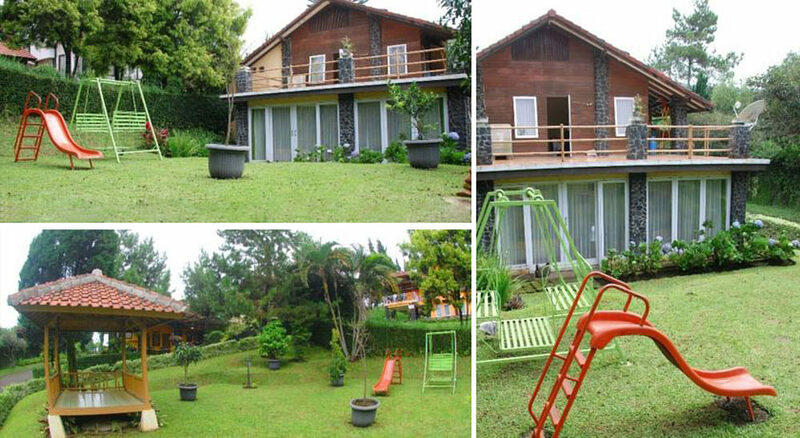 This villa is located in a well-known villa complex, Villa Istana Bunga. 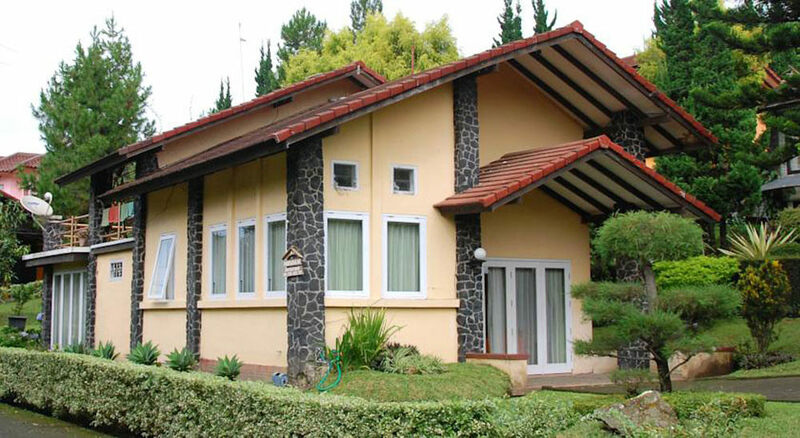 Villa Minerva is located near the entrance, so it’s convenient to reach. 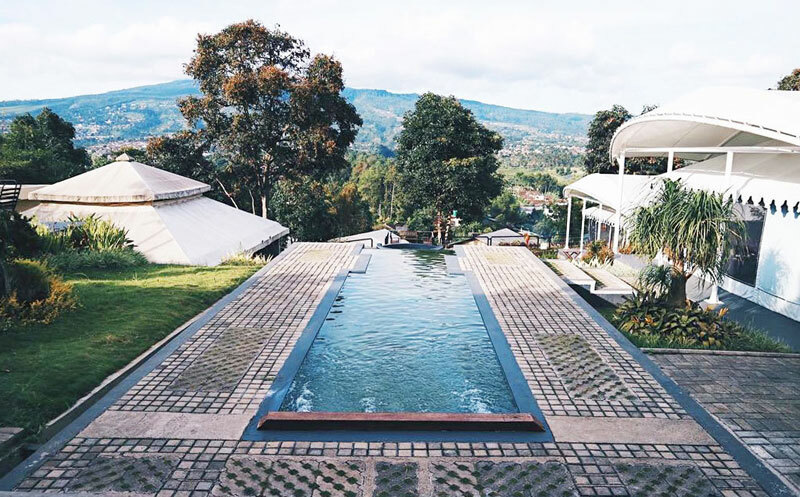 You can have the whole villa for your family with as much comfort as you have back home, only that this time, it’s topped with jaw-dropping views of the Lembang highlands and calm neighborhood. 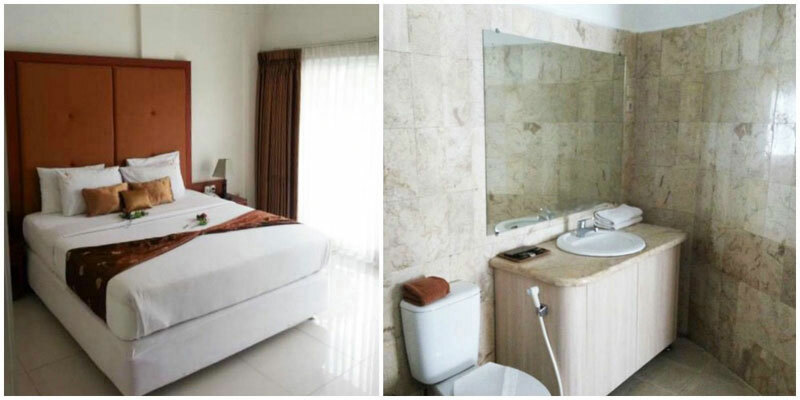 Every facility is provided to support your comfortable stay, with 3 bedrooms and 3 bathrooms, with your own kitchen, including a rice cooker, refrigerator, and tableware. 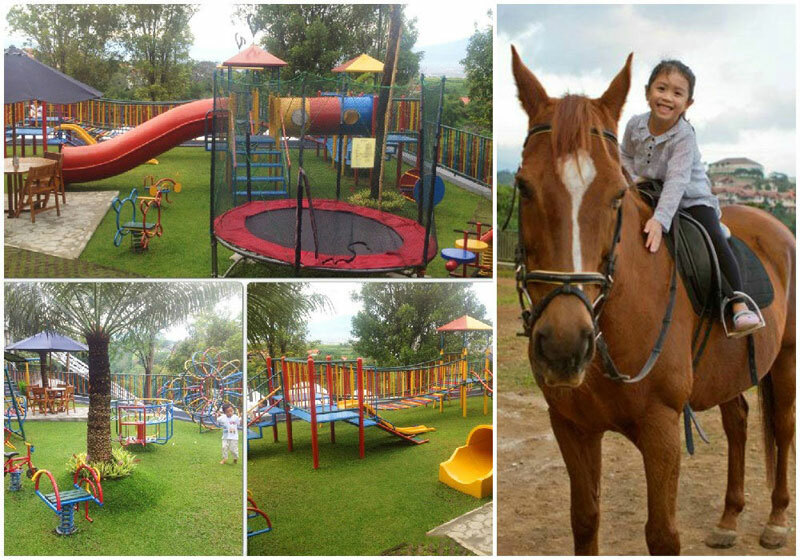 Entertainment is also guaranteed with a karaoke set, barbeque kit, wifi, and kids’ playground. Very often, family and nature are two things we can’t live without. 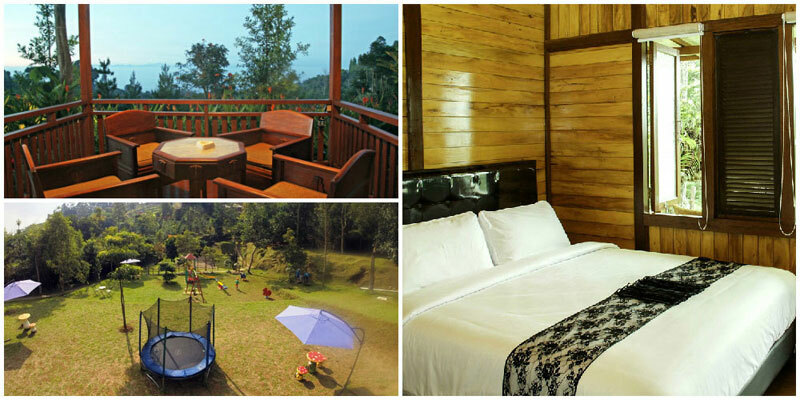 Bring your dear family to this tranquil nature resort and you can have it all. 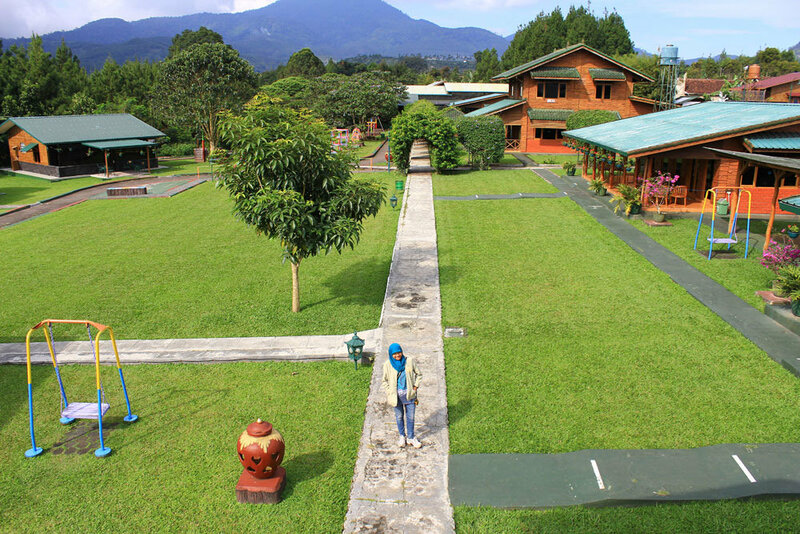 This beautiful resort is artfully decorated with parks where you can breathe in the flora and fauna all around you – bikes are also provided, so you can cycle around with the kids whenever you like! And if you are a fish lover, regardless of whether you love to eat fish or feed fish, you don’t need to worry about feeding fish (as pets) and subsequently catching them to eat in the next minute. 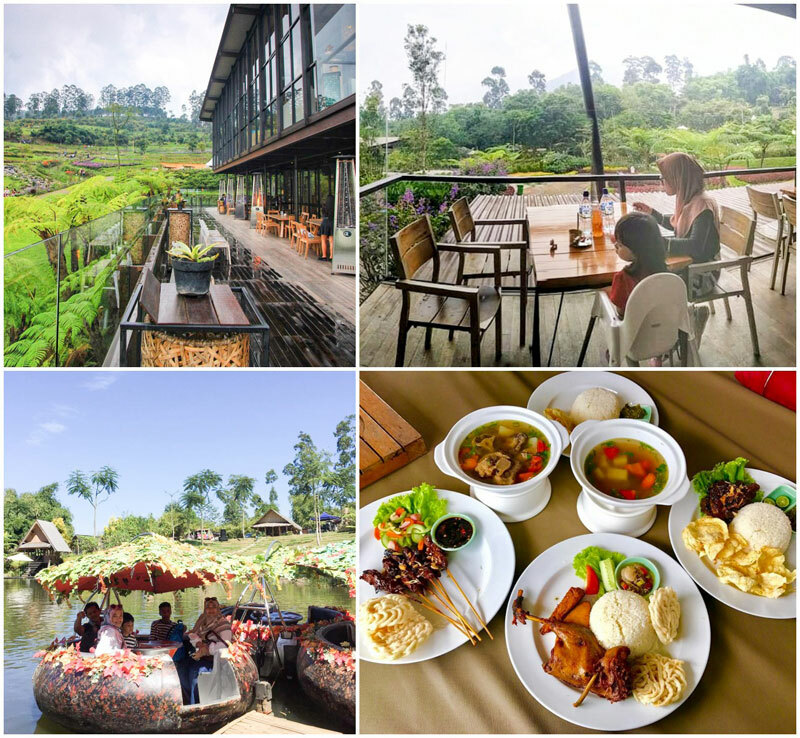 There’s two separate ponds – a fish pond for you and the kids to feed the hungry carps, and another pond for you to fish out your catch of the day to feed your own hungry tummies. A playground is also available for the kids – at all times! 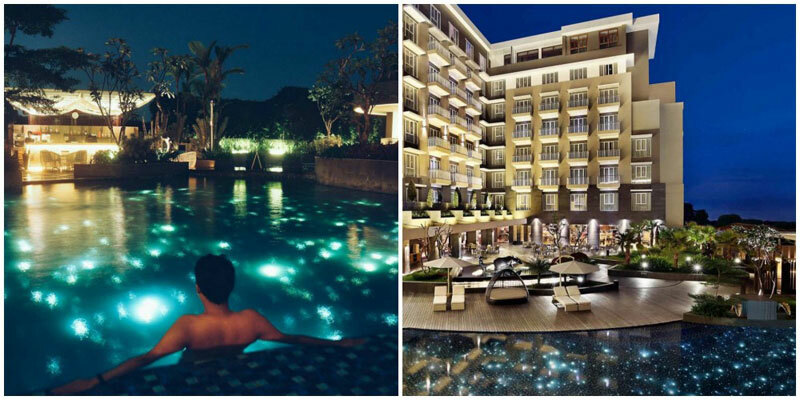 You may easily find shopping centres, quirky restaurants and unique activities around Setiabudi area but we bet you won’t need a reason to leave your hotel if you opt to stay at Mercure Bandung Setiabudi! 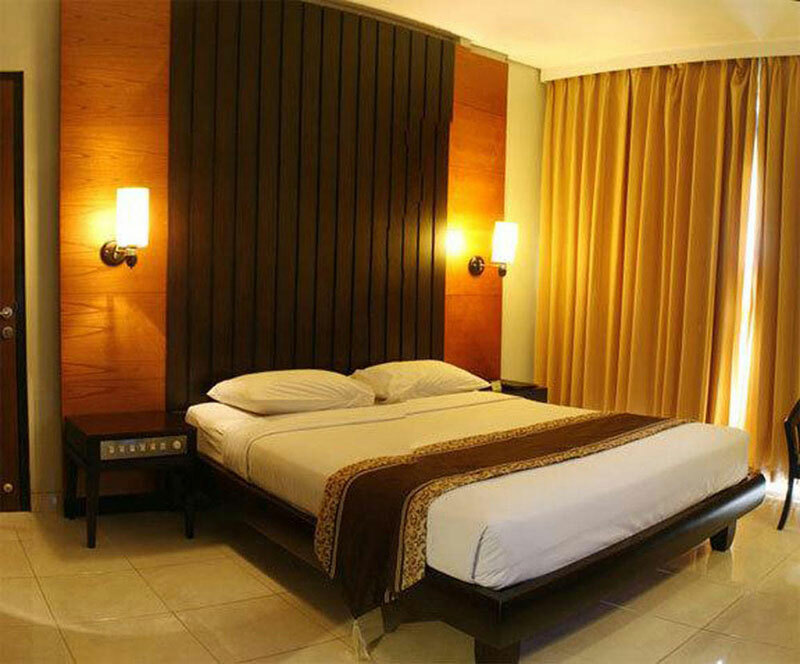 The hotel welcomes families with various room categories (including pool-access rooms) that offer space and luxurious comforts. 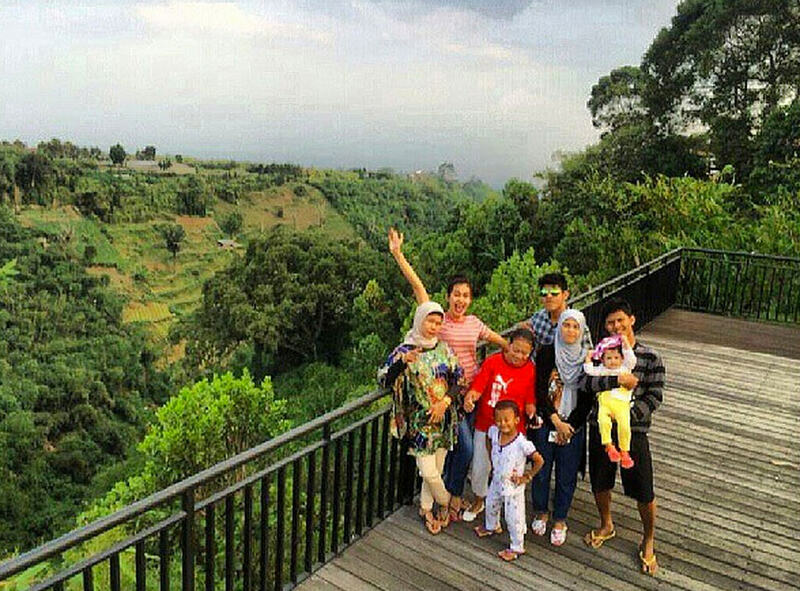 At Mercure Bandung, your family vacation turns into a chance to make unforgettable memories! 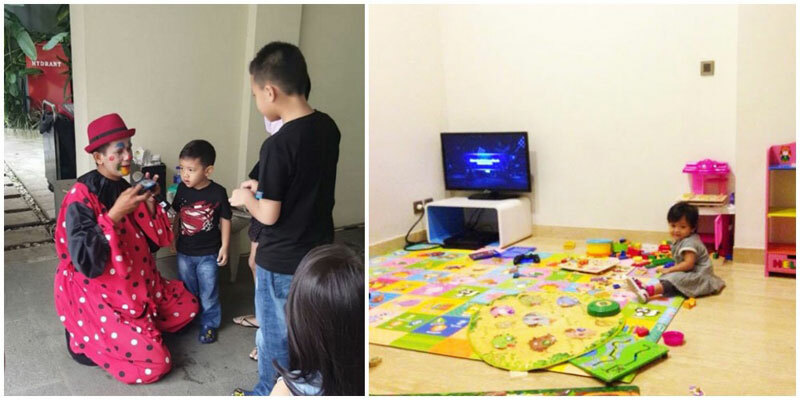 Aside from the toys’ and drawing/colouring corner, you can also find a PS3 station at the kids club. Time for a fun battle with the kids! 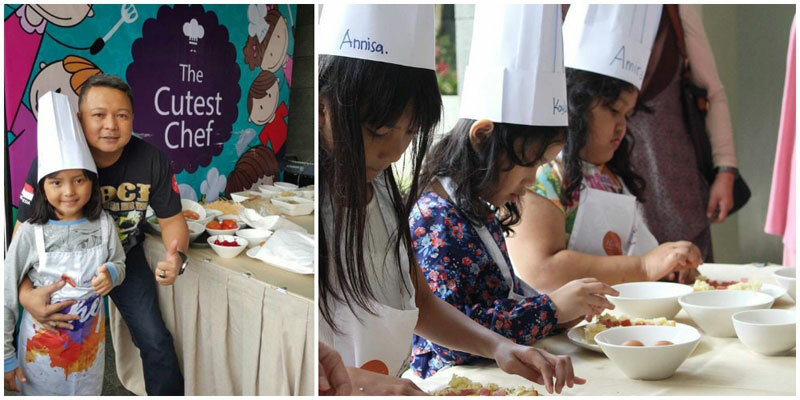 If you’re visiting during the weekends, sign up the kids for a fun cooking activity – “The Cutest Chef”, and let them express their inner culinary talents! Held by the pool, your kids get to learn basic skills from the professional chef and prepare delicious treats. Who knows, you might have a MasterChef in the family?! 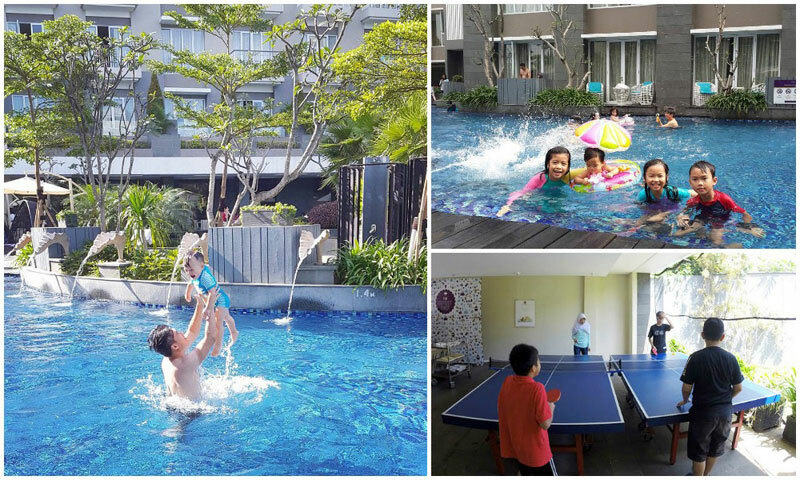 Other activities include table tennis and their ultimate galactical pool. Besides being heated, the infinity pool is adorned by numerous sparkling lights that resemble shining stars and you can swim among them! Fall asleep to cooler climates and wake up to the sweet scent of strawberries at Rumah Stoberi Organic Farm & Family Lodge. 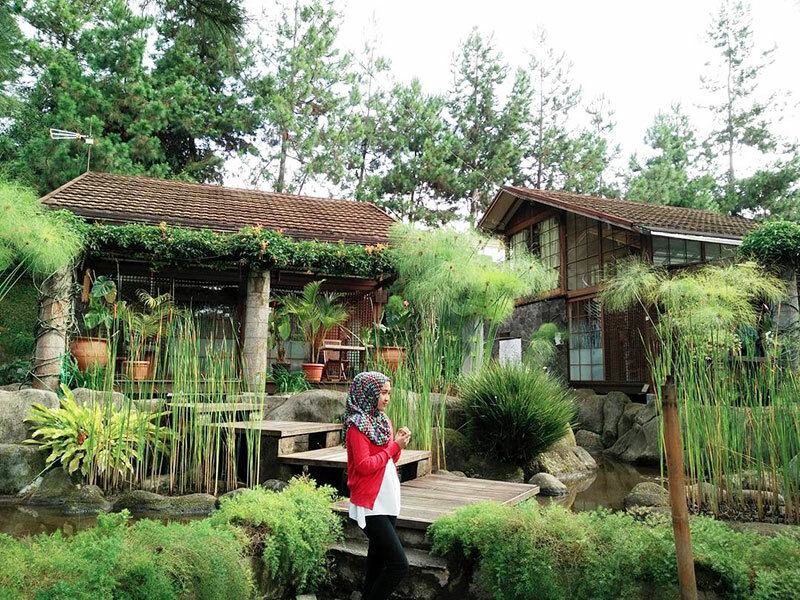 The stay is a nature wonderland where you can escape from city madness to enjoy family time in the highlands. Nothing beats the experience of learning from nature! Introduce your kids to the fun of farming and take them strawberry picking, as you teach them where their food comes from! 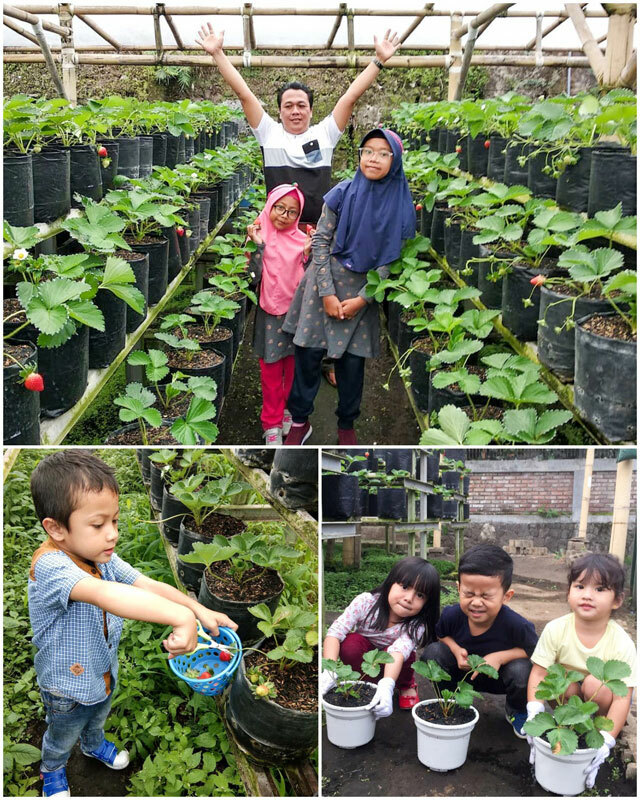 The strawberry farm is located in the chilly region of Lembang, and is known to be the only strawberry farm in town with all-year-round strawberries, and they house more than 30,000 strawberry plants! 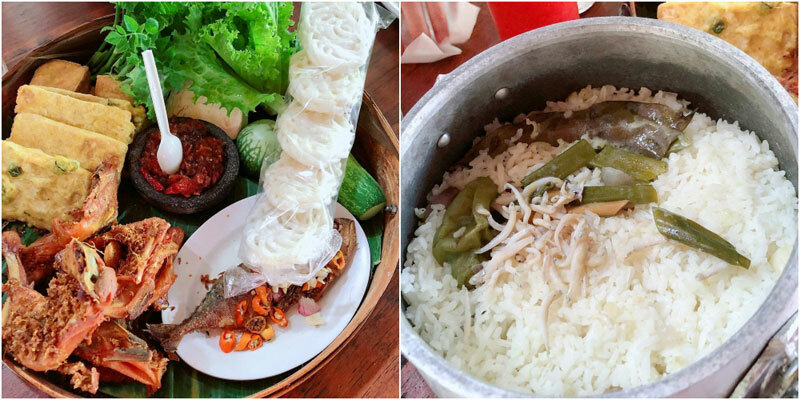 The property also features a cosy and intimate restaurant where you can enjoy organic vegetables from their garden and indulge in the all-time-favourite, the star on the menu, *drumroll* – the legendary Nasi Liwet and while you gulp down, treat the kids with strawberry-everything like their Strawberry Fried Rice and Strawberry Banana Fritters! 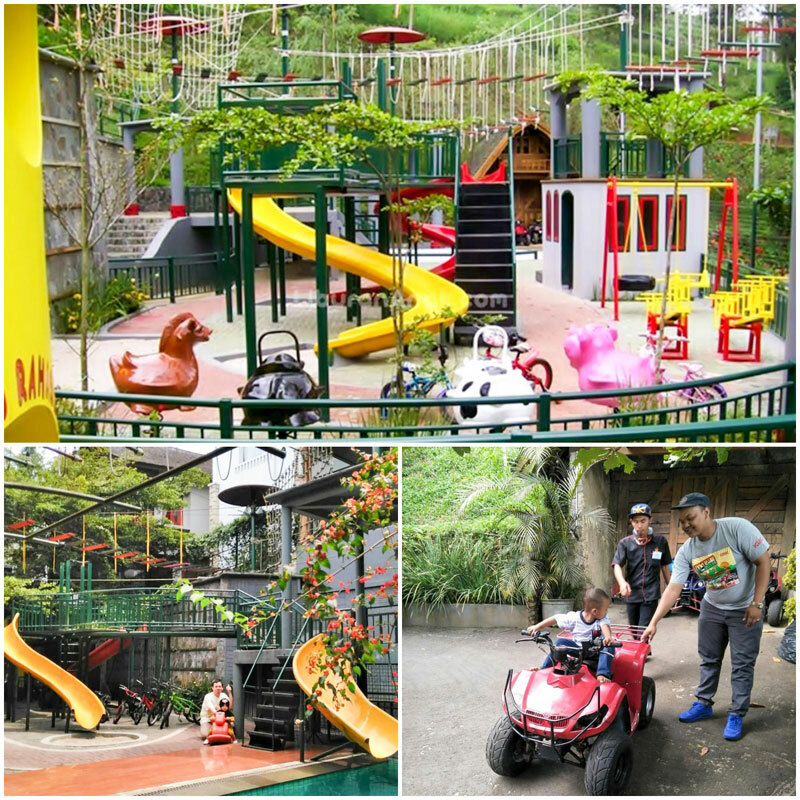 For those looking for some action and willing to try out some thrilling outdoor activities such as flying fox, sliding board and ATV, you’ll be glad to know that these are also available within the property. The stay offers three types of villas for different travelling groups, ranging from three to five-bedroom options so even extended families are most welcome! 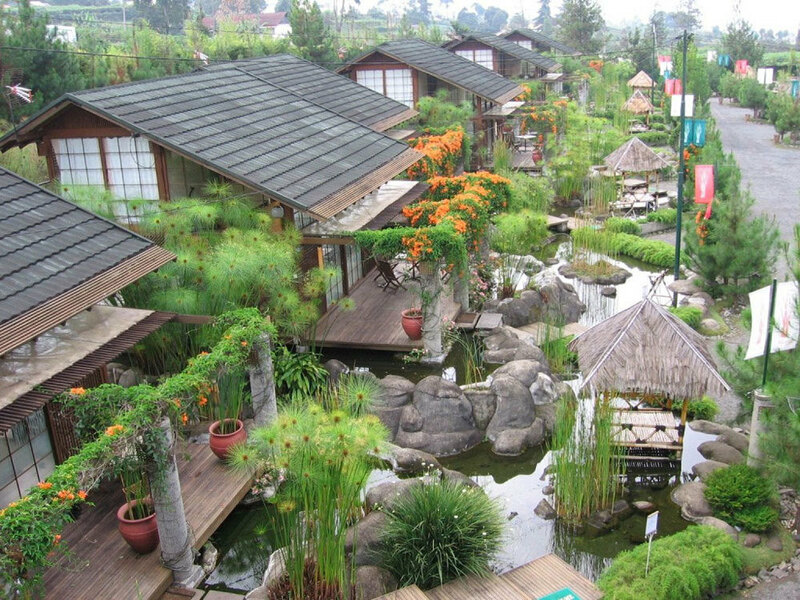 Grand Tjokro Bandung caters to unique animal experiences. 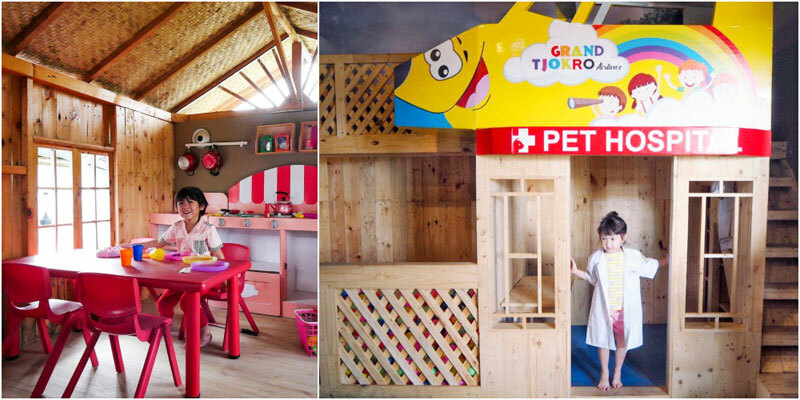 In here, your sweet family gets to enjoy cuddly time with furry little creatures at their rooftop mini zoo. 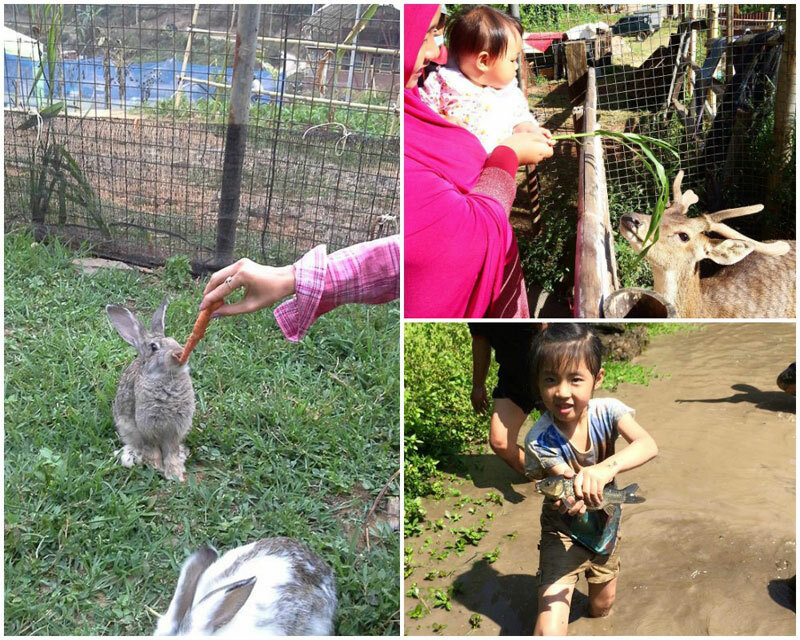 Although you won’t find exotic and wild species, your kids will enjoy getting up-close with the cute calves and bunnies here. 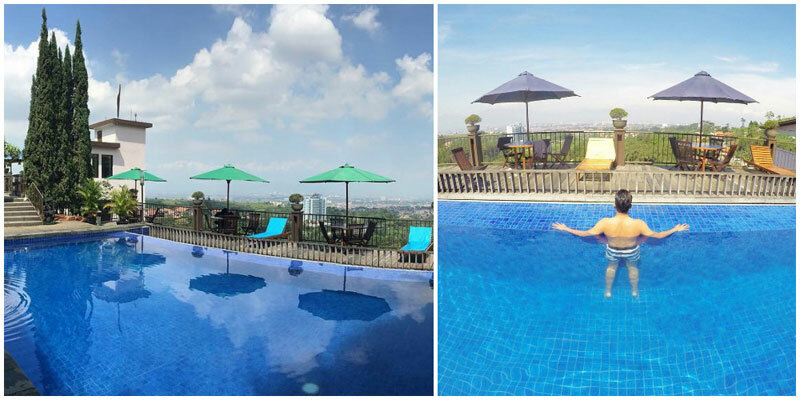 An ideal post-petting session would be a refreshing dip in their rooftop infinity pool, all the while enjoying stunning views of Bandung City. 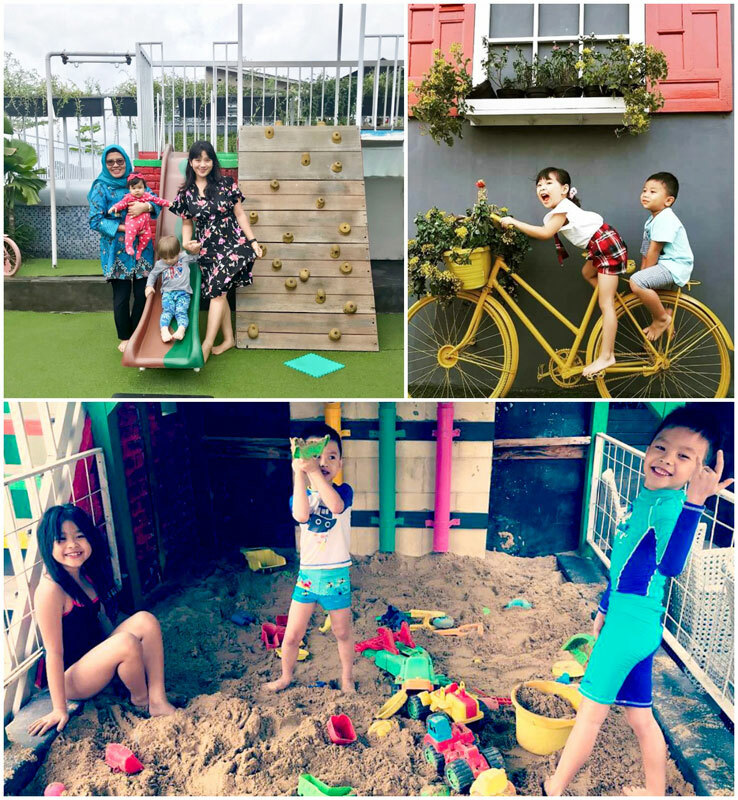 Kids are entitled to a fun playground with an exciting sand pit too. 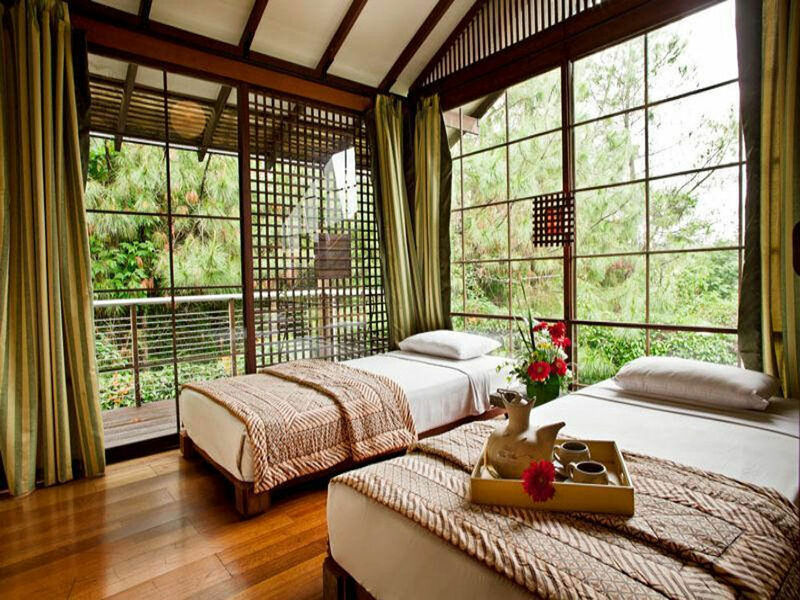 Besides, Grand Tjoko Bandung also provides an on-site spa for ultimate pampering sessions. See, it isn’t all about the kids; parents have been kept in mind too. 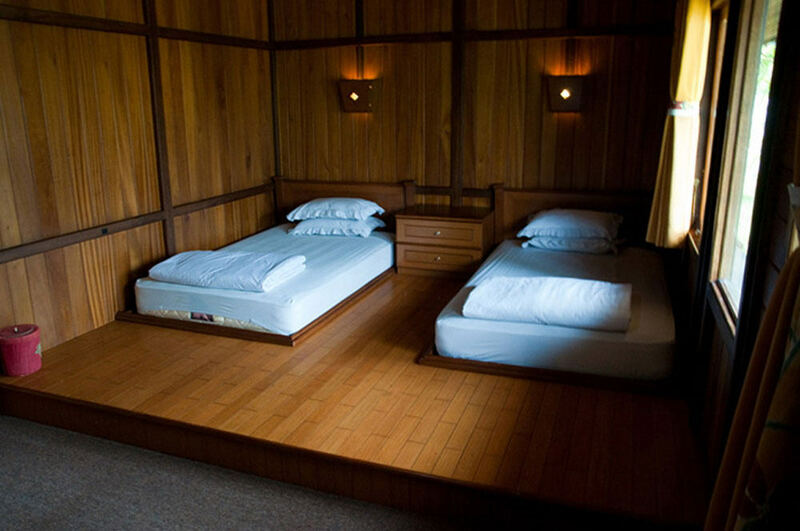 Rooms are spacious with bed so comfortable that the kids might well spend their whole night in theirs rather than sneak into yours! 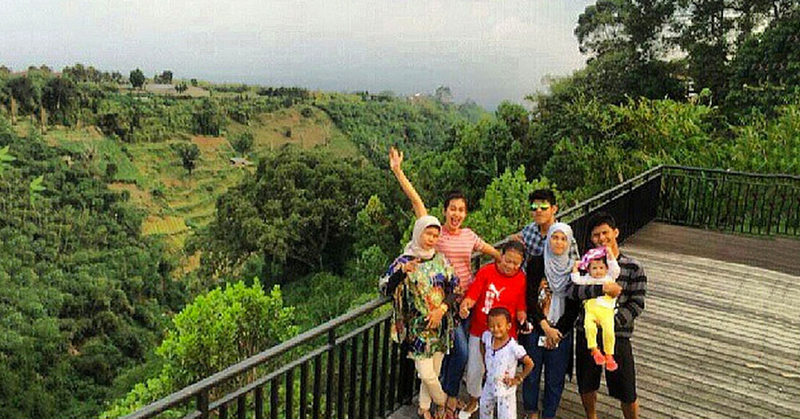 Want to splurge on this family getaway? 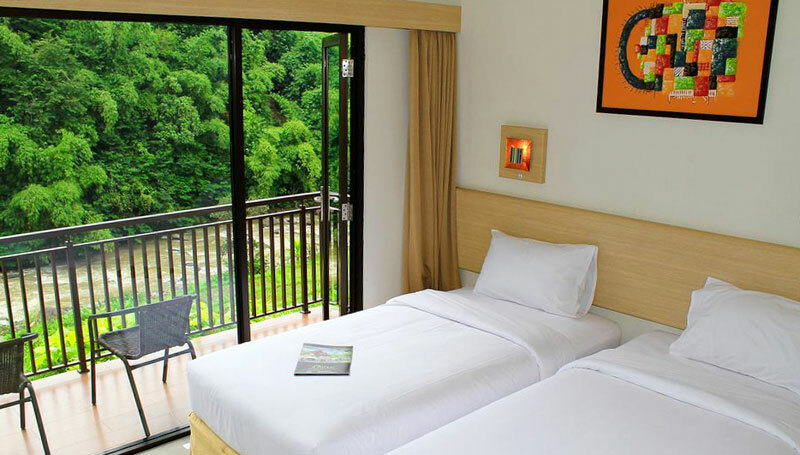 Located just a stone’s throw away from Indonesia’s largest amusement park (Trans Studio Bandung), The Trans Luxury is an ideal abode for kids and adults alike. 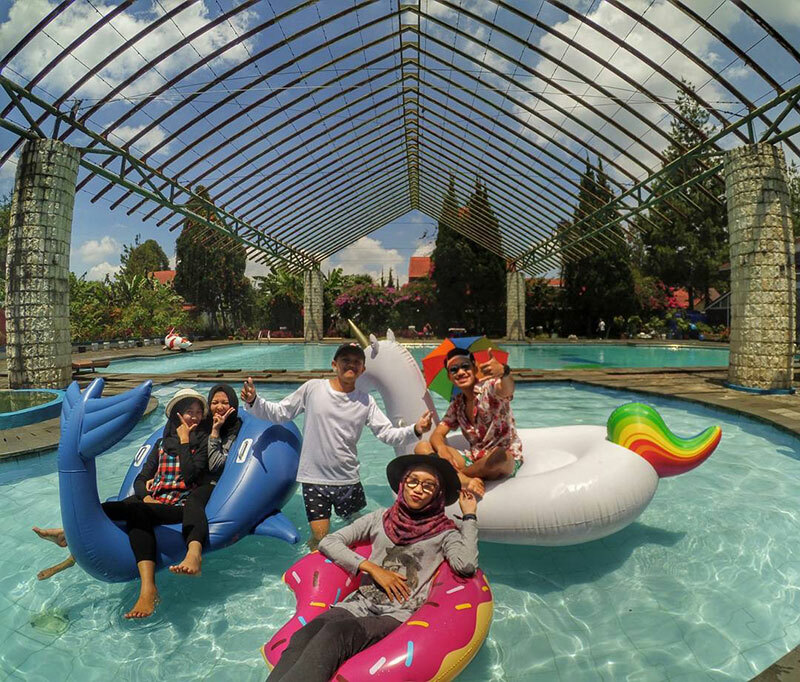 And what can you expect besides ultimate fun when a hotel is from the same group as an exciting amusement park? You can even find a beach pool with white sand imported from Australia, so clearly they aren’t messing! 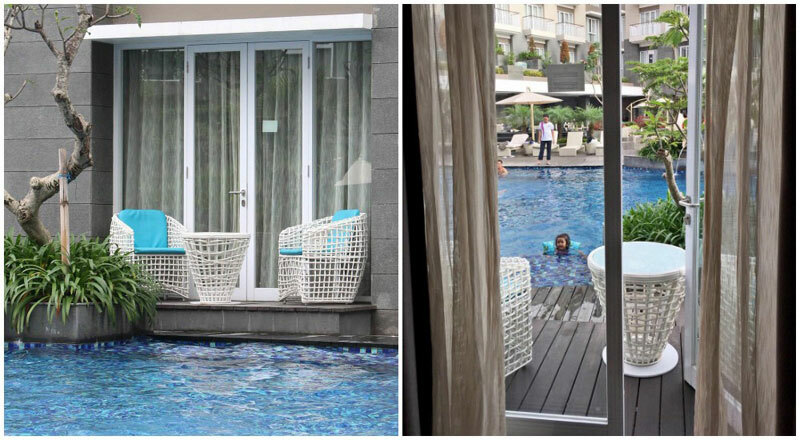 Perhaps you can enjoy the presence of the hotel’s sunken bar while the kids enjoy building sandcastles by the pool. Some cuddly family time at the jacuzzi wouldn’t hurt either! Give your kids (and yourself) their own free time by signing them up at the on-site kids’ club. 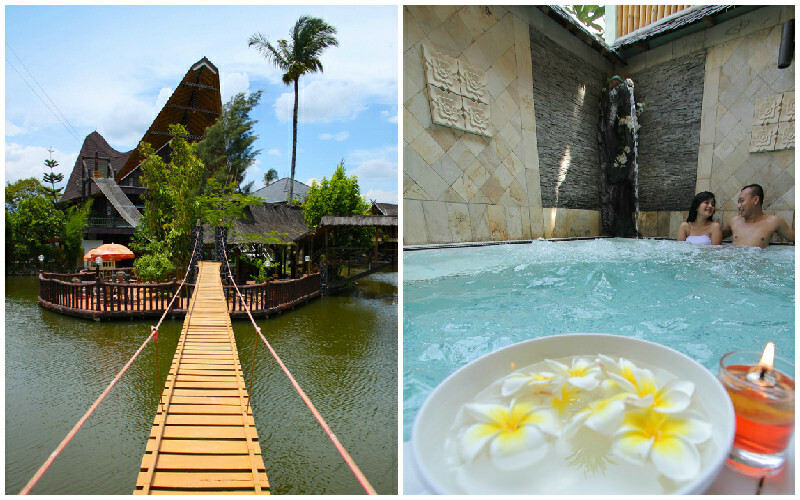 while you explore the hotel’s hidden relaxation corner, also known as the spa. 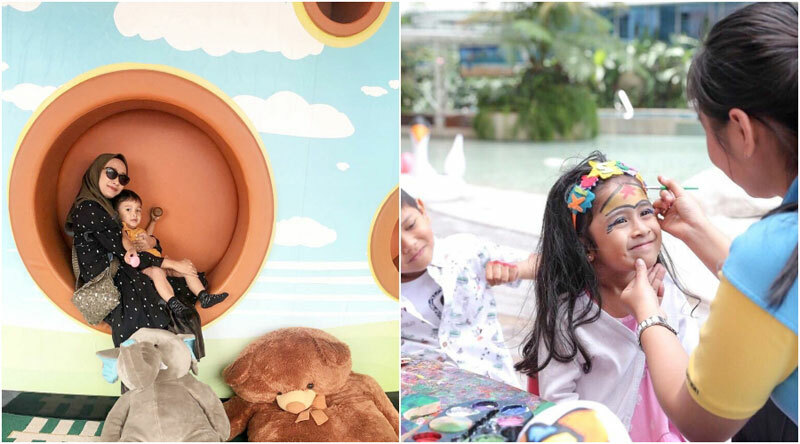 Trust us, there won’t be a second where your little ones will be looking for you as they’ll enjoy fun activities like puppet shows and digital entertainment while being supervised by the caring staff. 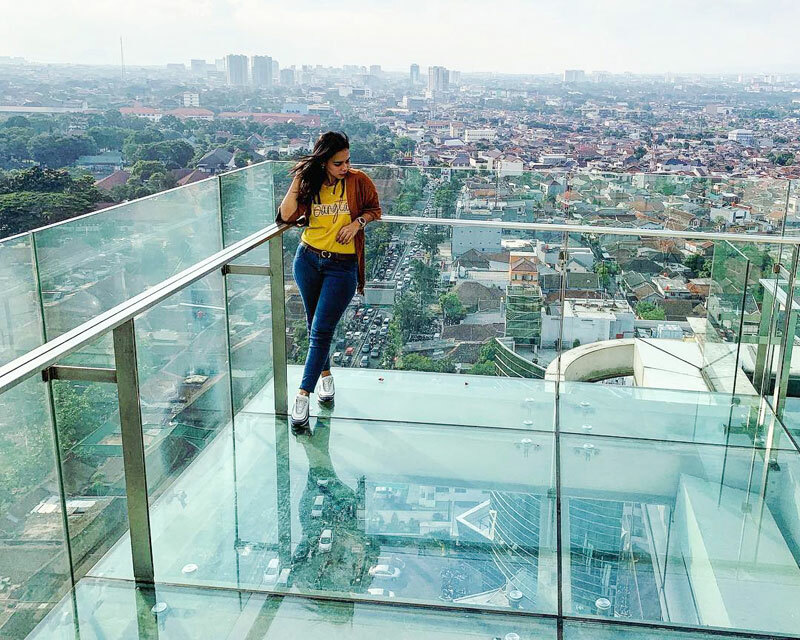 Of course, if you’re looking for more entertainment, a step out from your hotel is all that is required as Trans Studio Bandung sits right across the street with a collection of thrilling rides! 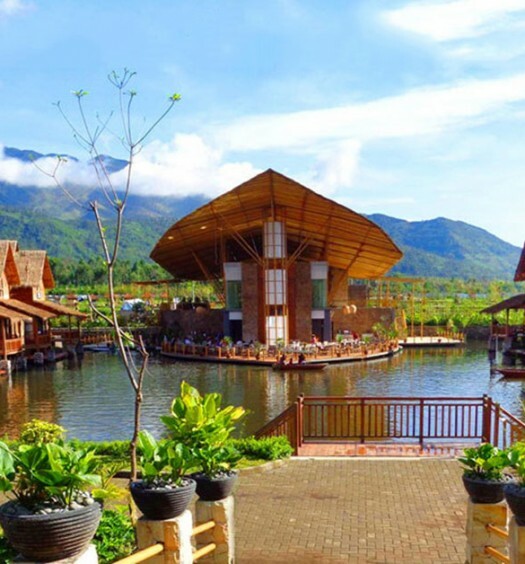 Your trip all the way to Garut will not be in vain when you reach this spacious and well-designed resort. Despite its modern design, it’s situated far away from the city, and in the depths of nature – with green surroundings and a mountain view. 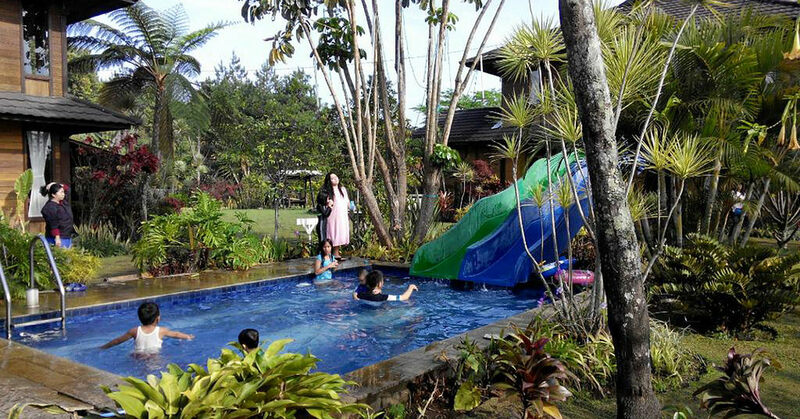 And which child doesn’t love splashing around in a pool? 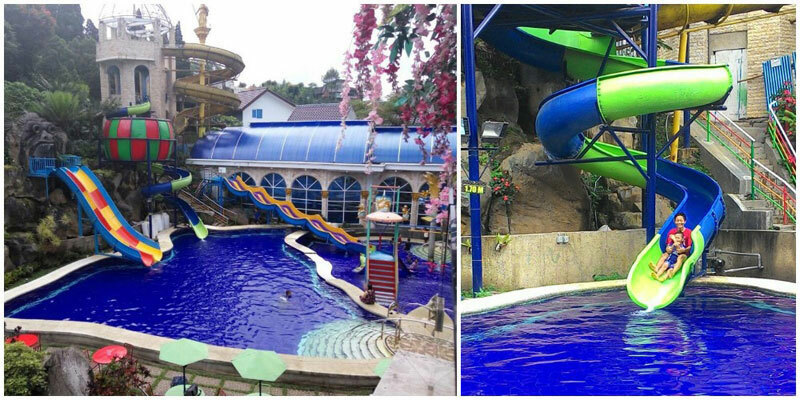 Your kids will love this pool with great water slides where they can have their own fun water adventures! 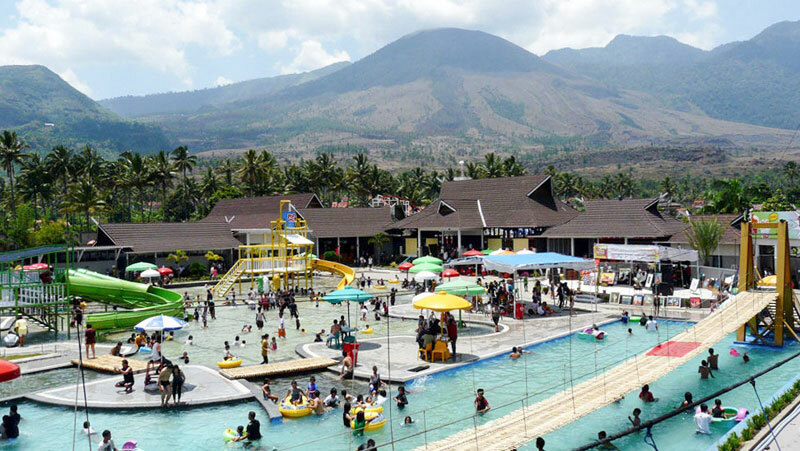 This resort also offers what Garut have best – a hot water spring, which is a good therapy for the whole family. 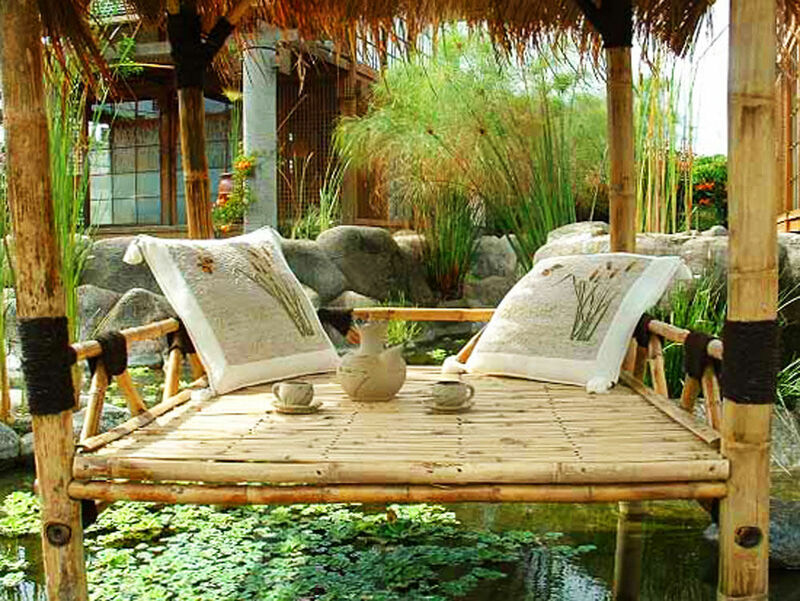 Perfect for a relaxing session after all the fun! At Danau Dariza, the steps from your villa lead directly into the man-made lake – almost like a water villa you can find in the Maldives. 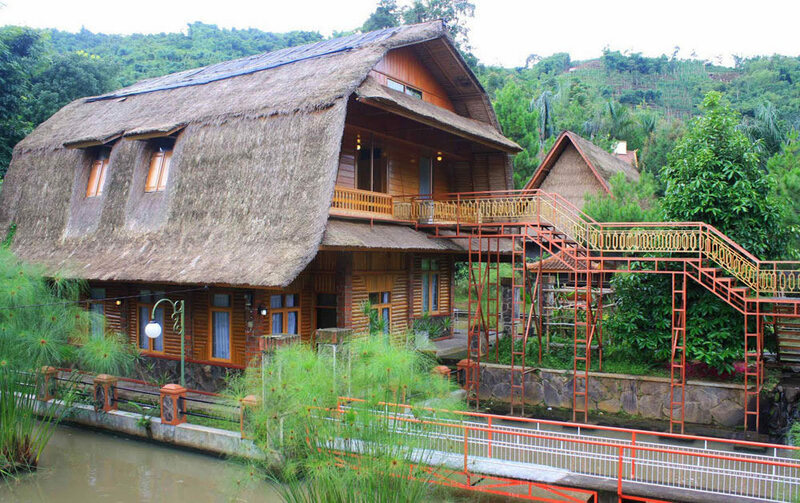 The façade of the villas is decorated and designed with Indonesian traditional culture and heritage. 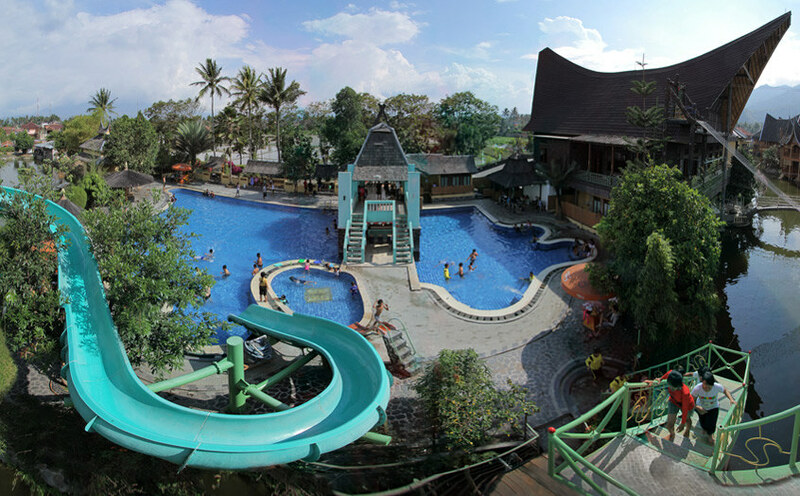 Don’t forget to make full use of the facilities – there’s a tennis court, kayaks and a swimming pool with slides. 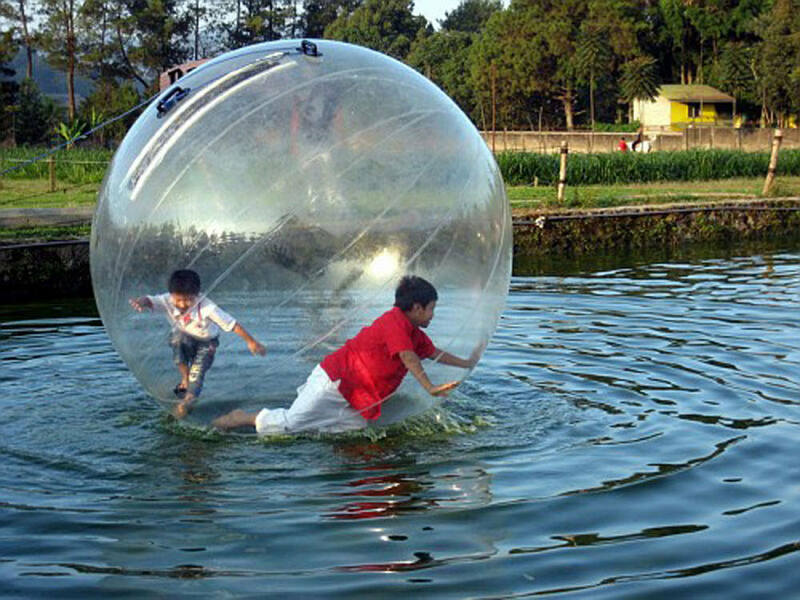 And your kids will love the swan water bicycle rides on the lake! 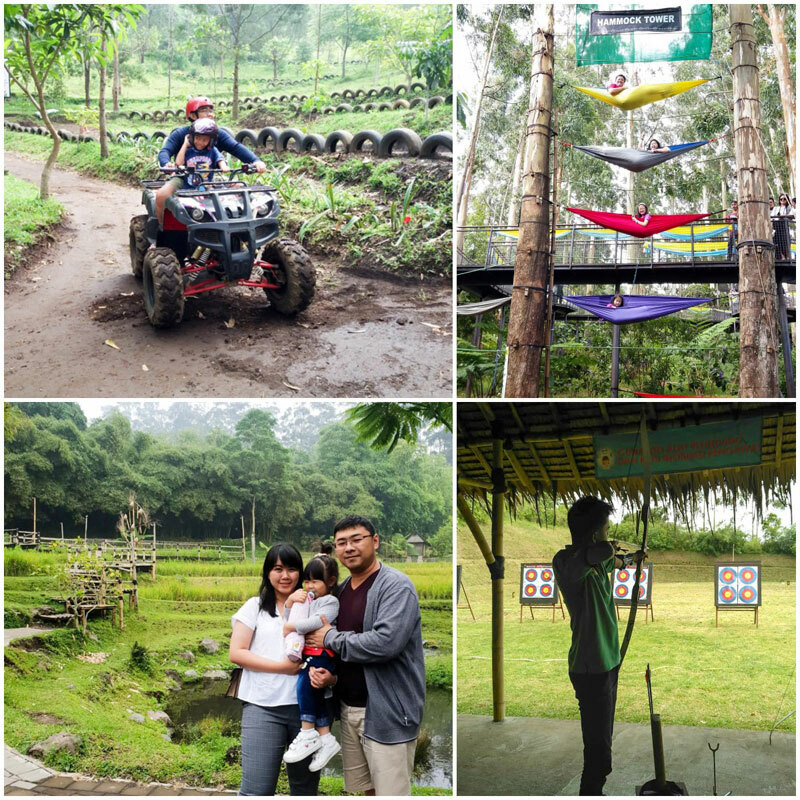 Are there any more great family hotels in Bandung with exciting playgrounds and activities that we’ve missed out? Let us know about your memorable experiences in the comments below!